I can tell you that with heat stifling out all stamina out your body, it is not easy to devise or cook anything. The grumbling Missus somehow managed to come out (of the infernal kitchen) with a refreshing idea. 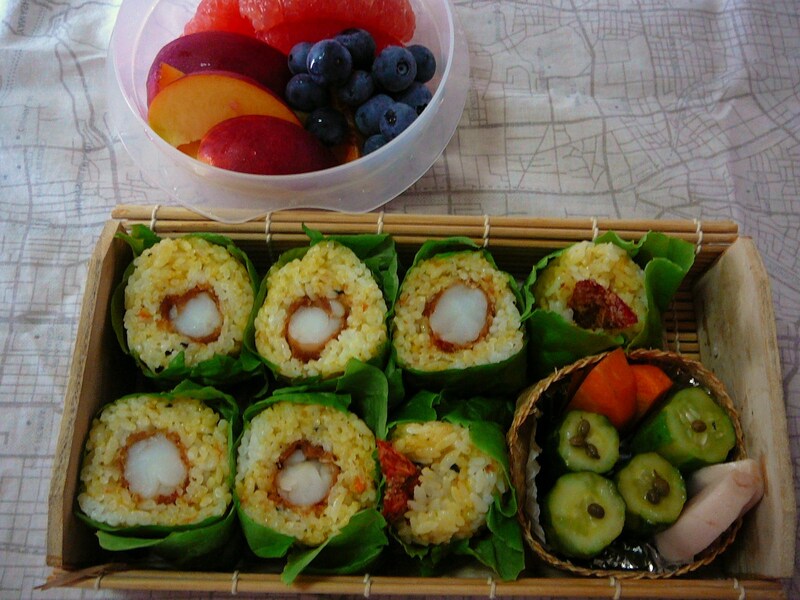 First she had thought of preparing a chirashizushi/decoration sushi, but quickly switche to rice balls. 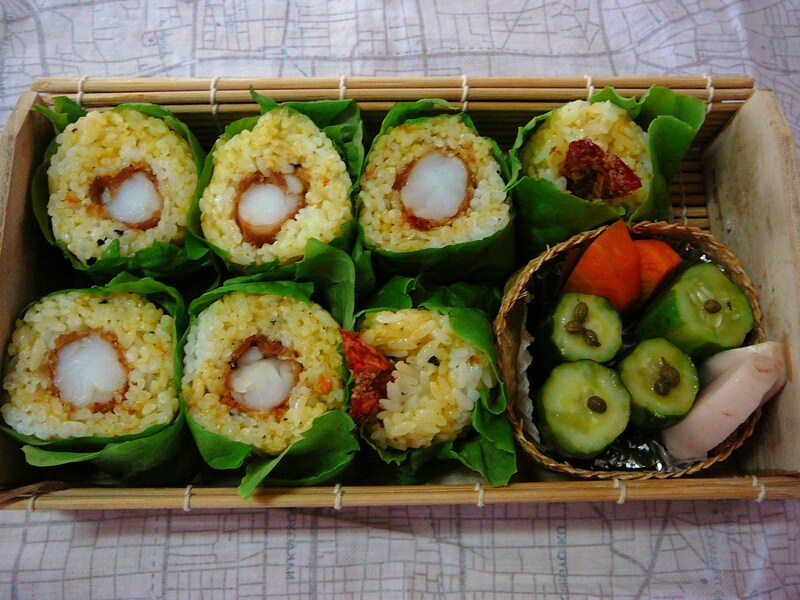 Sushi rice balls. 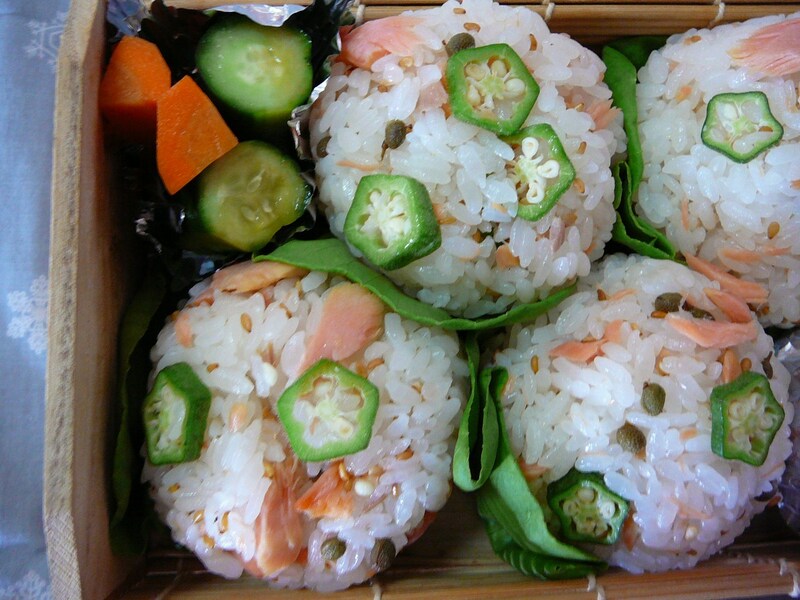 not ordinary rice balls. 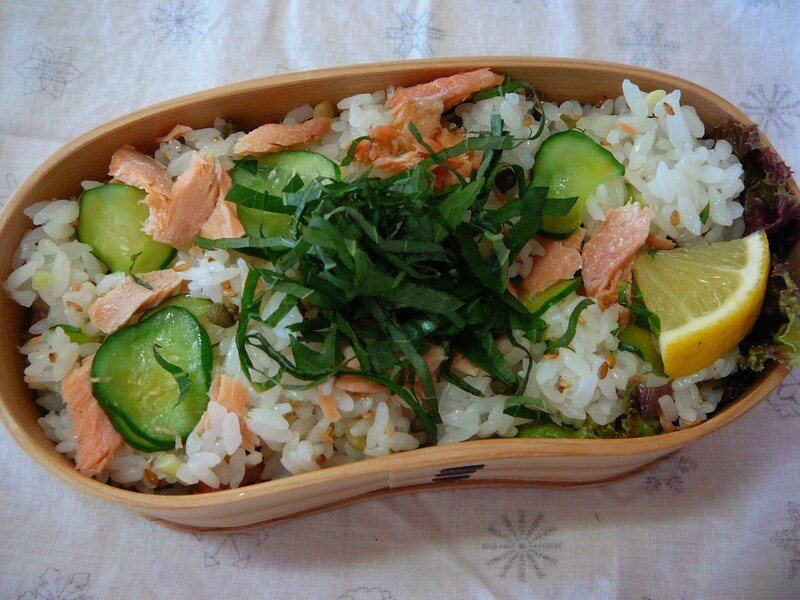 After steaming the rice (with konbu seaweed) and prepared it as sushi rice, she mixed in sesame seeds and fried salmon flakes. 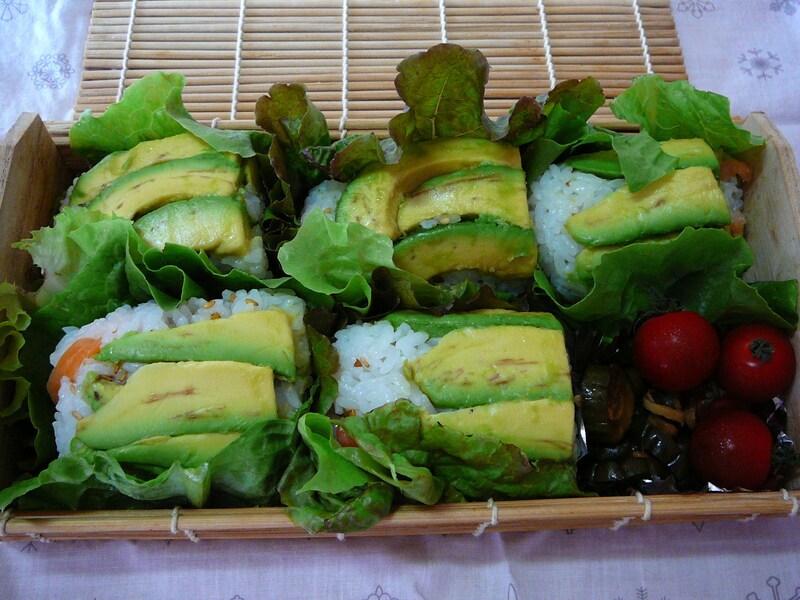 After forming the rice balls she wrapped them in lettuce and placed them inside the box. She then “decorated the balls with raw sliced okra for great effect. A few sansho/Japanese pepper (home-pickled) also entered into the equatione for extra taste. As for the salt quotient needed in these sweaty days she added home-pickled carrot and cucumber. The tamagoyaki was plain but delicious. I actually like it plain most of the time. More pickles with home-made wasabi stem pickles. 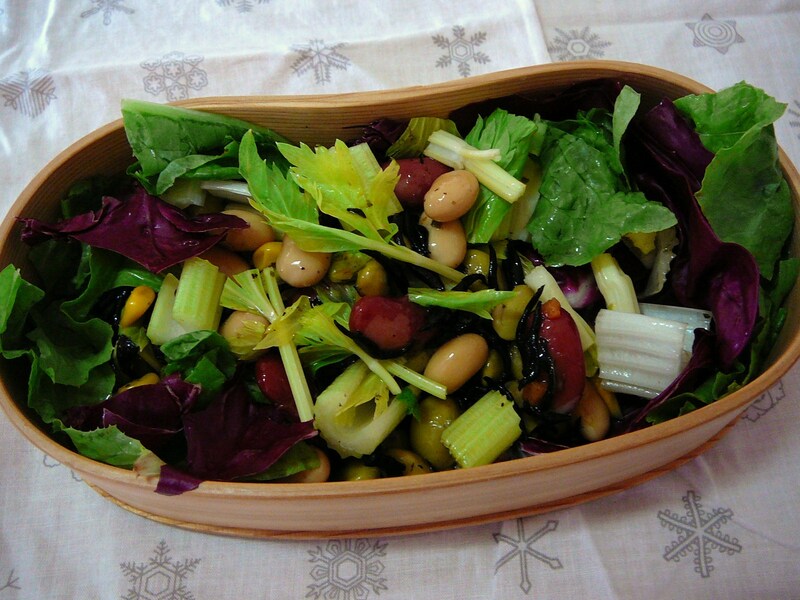 Plenty of colours and nutrients in the salad/dessert dish with beans and cheese salad decorated with Shizuoka Ameera pearl tomatoes, Japanese nashi pears an prunes. Certainly felt better for the whole day! 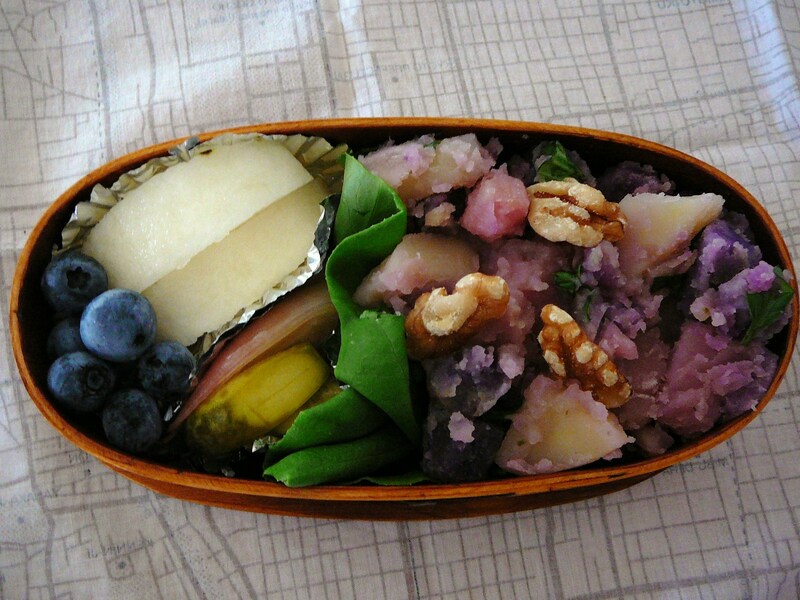 “Soboro” is a form of decoration in Japanese gastronomy. It is almost impossible to translate, although it means that the decoration looks like little snow balls, whatever they are made from. 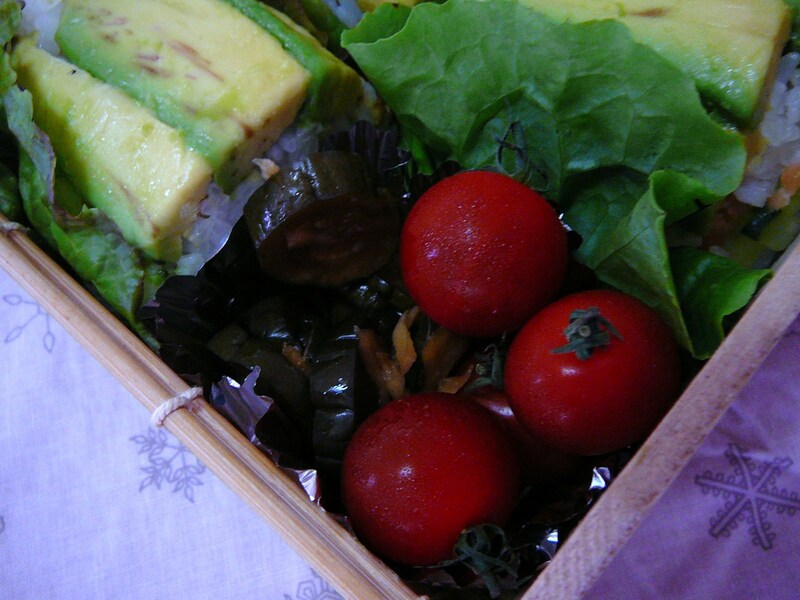 They are extremely popular in home-made bento. They certainly make for beautiful geometrical designs and colours! 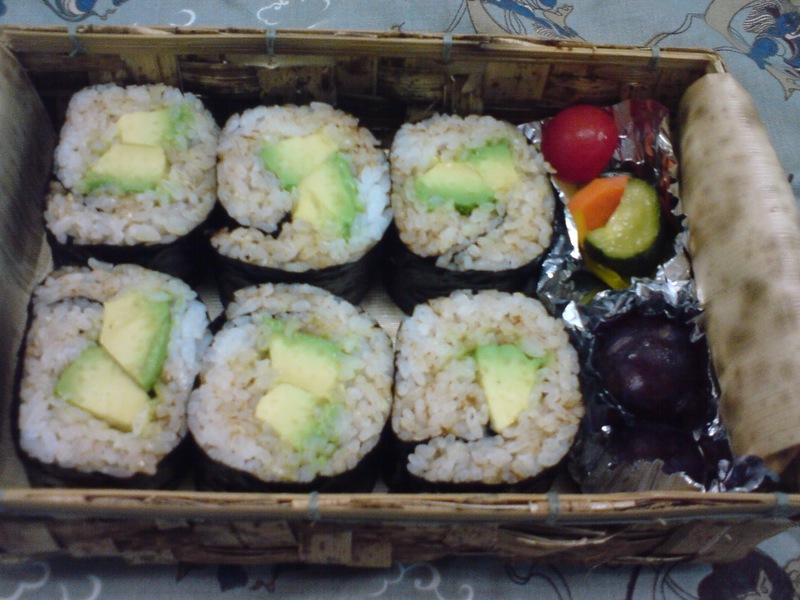 The Missus first prepared fresh sushi rice. 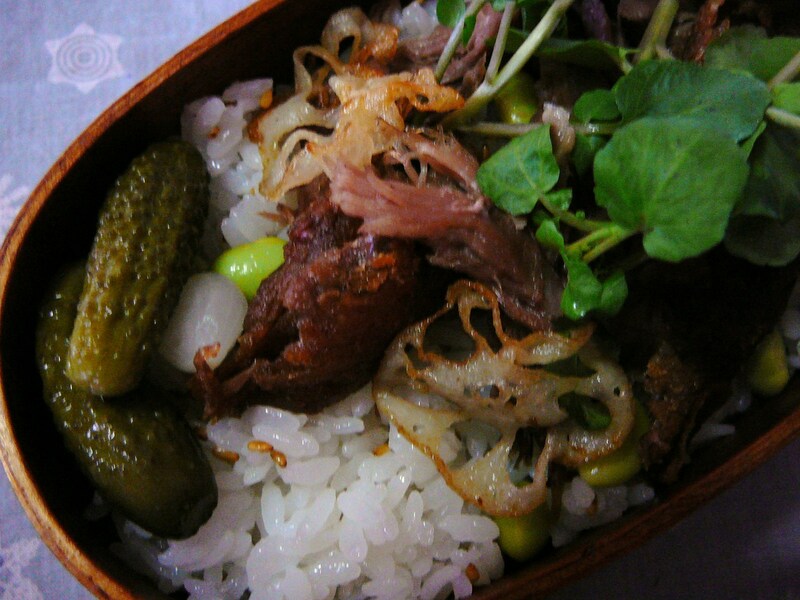 She then mixed it with a little of each soboro, finely chopped Japanese pickled cucumber and sesame seeds before fuiling the first box. 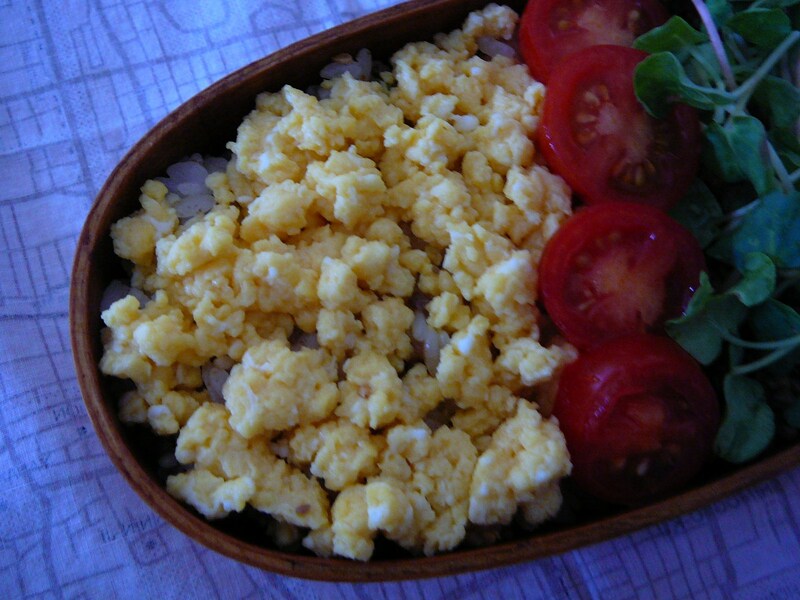 She covered the left half with egg soboro. You could compare it to a sweet scrambled egg. She made it this very morning. 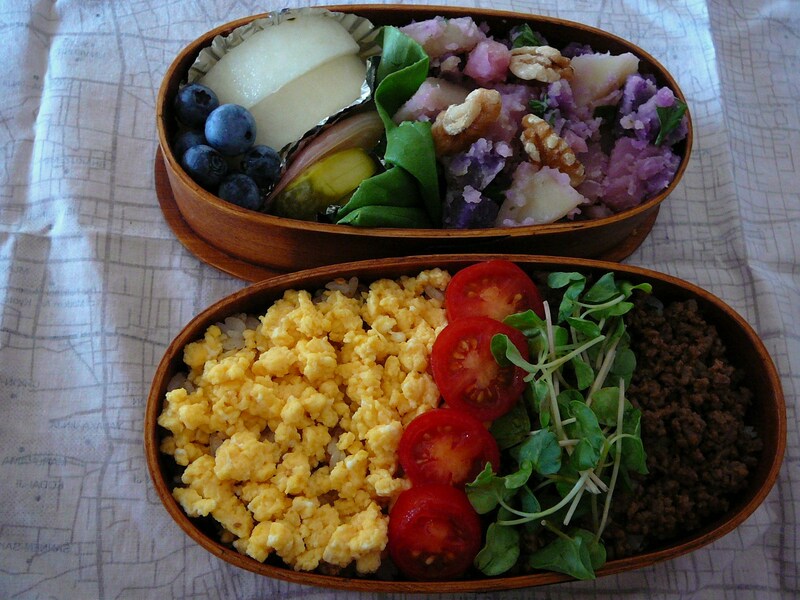 Colours and nutrients are provided with sliced mini tomato and buckwheat sprouts/himesoba. 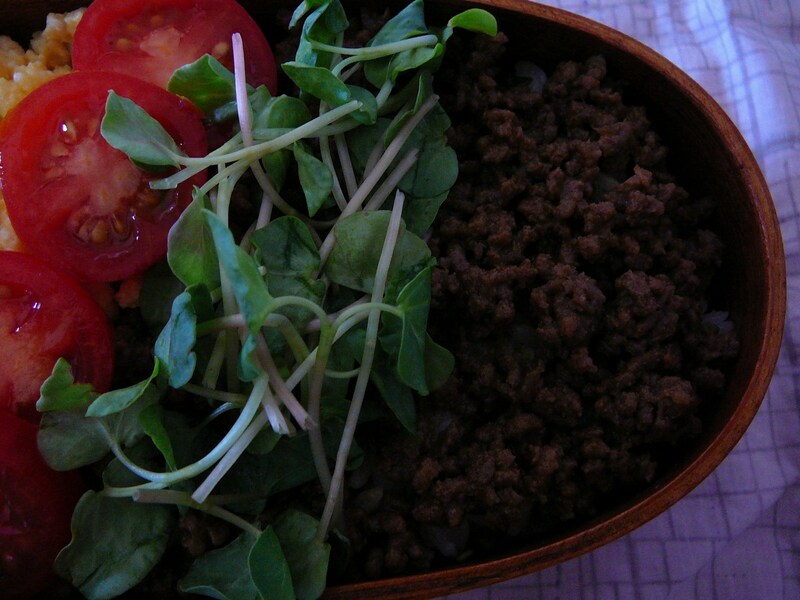 The right part is covered with meat soboro she prepared the night before with minced pork and beef. Plenty of colours as usal with the salad/dessert box! 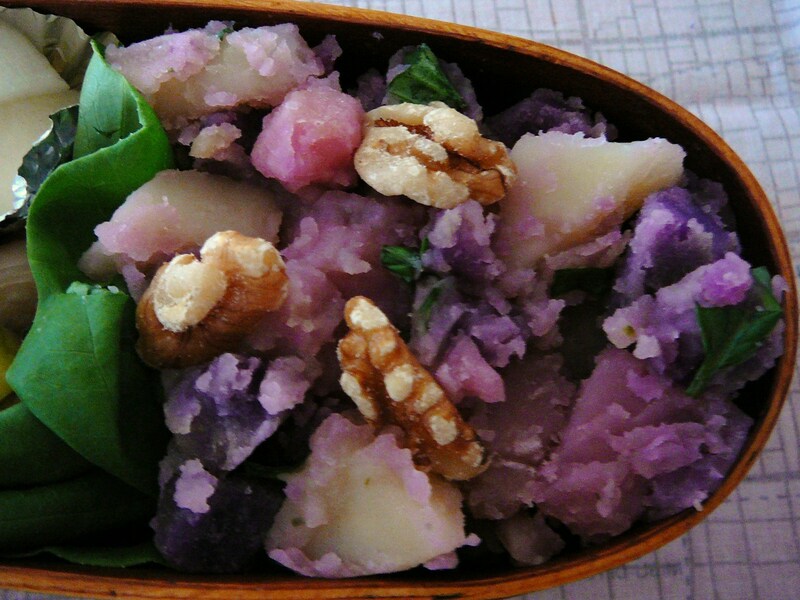 The salad consisted of boiled yellow and pink potatoes, violet sweet potatoes, walnuts and basil leaves from our verandah, the whole lightly seasoned with rice vinegar dressing. Some lettuce made up for the separation and more Vitamin C and fibers. Home-pickled mini melon and myoga ginger for the salt needed in these very hot days. More vitamins and fibers with Japanese “Nashi/梨” pear (so crunchy and juicy!) and large blueberries! I can see that hot day off with that! Did I say it was flaming hot outside? I am certainly going to enjoy my day in my air-conditioned office! 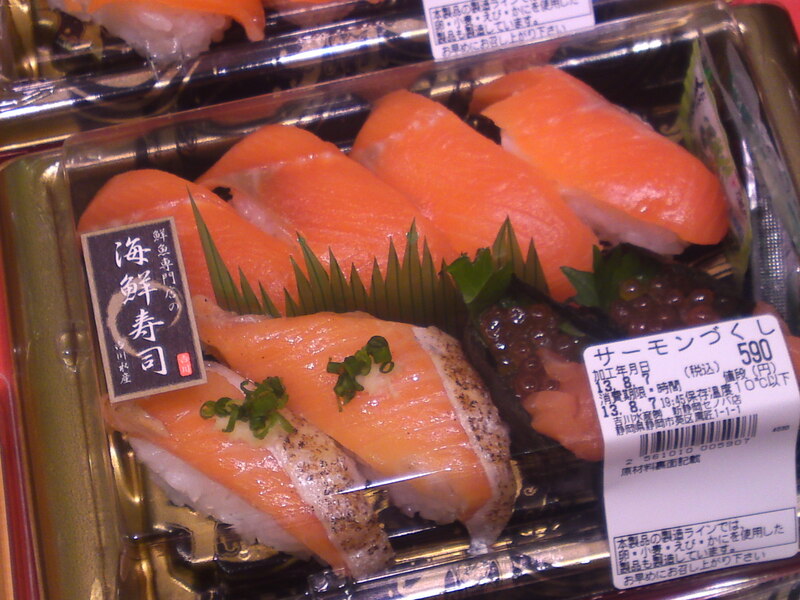 Salmon can easily be bought all year round at supermarkets as “Shiozake/Salted Salmon/塩鮭” and frozen when you have any left. The Missus is always keen on using some, although I always ask her to discard the skin and fat after sauteing it. 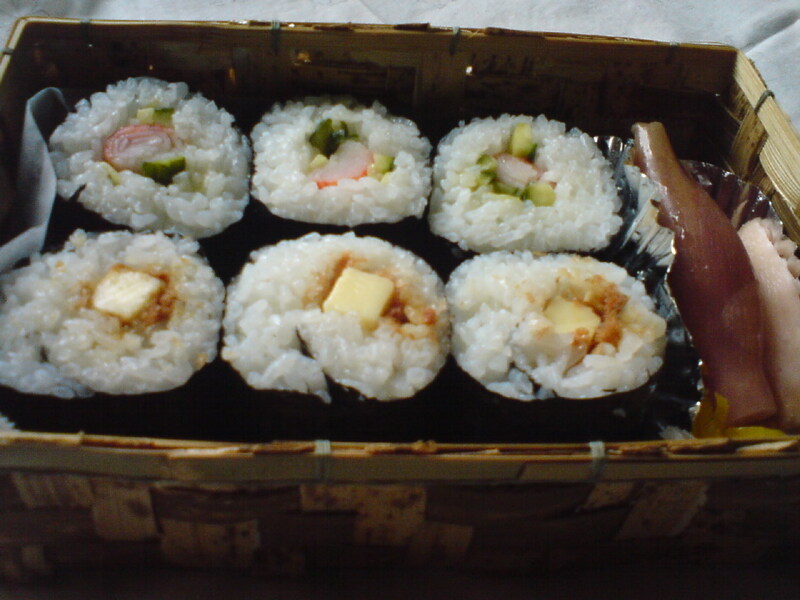 She steamed some rice with a big piece of konbu/seaweed before seasoning it into sushi rice. 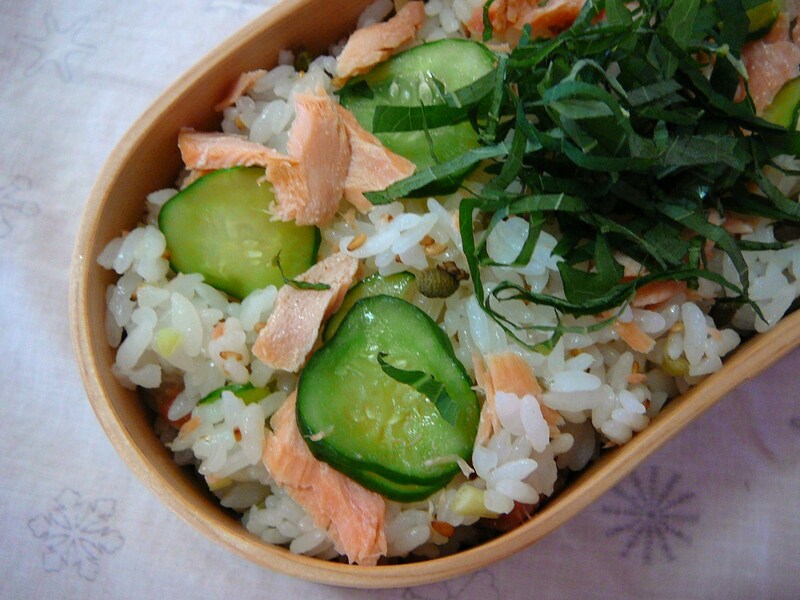 She mixed it with sauteed salmon flakes, thinly cut pickled myoga ginger and cucumber and sesame seeds (these were not cut, BG!). 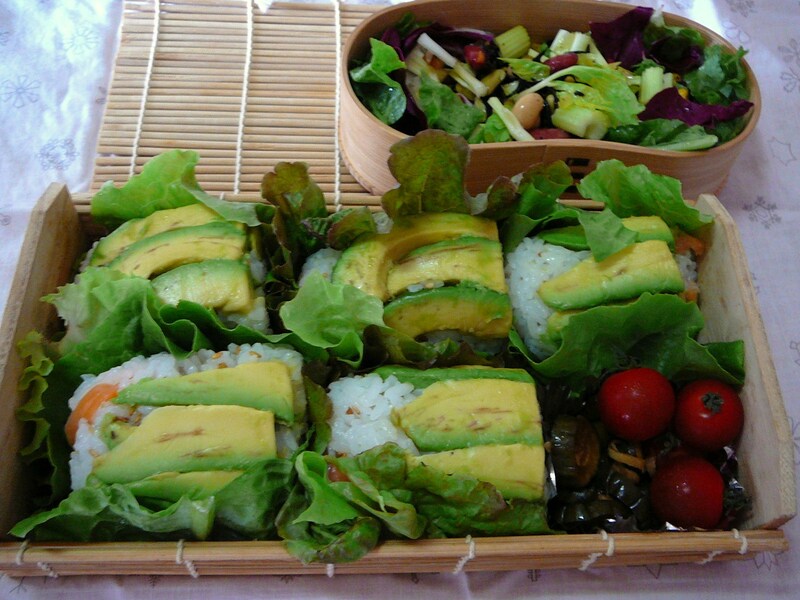 She lined the bento box with fresh lettuce before filling it with the sushi rice. She topped it plenty of thinly sliced fresh shiso/perilla leaves, home-pickled sansho/Japanese pepper and a piece of lemon for extra seasoning. The Missus came up with a Salvador Dali (or is it a Picasso?) like side dish! 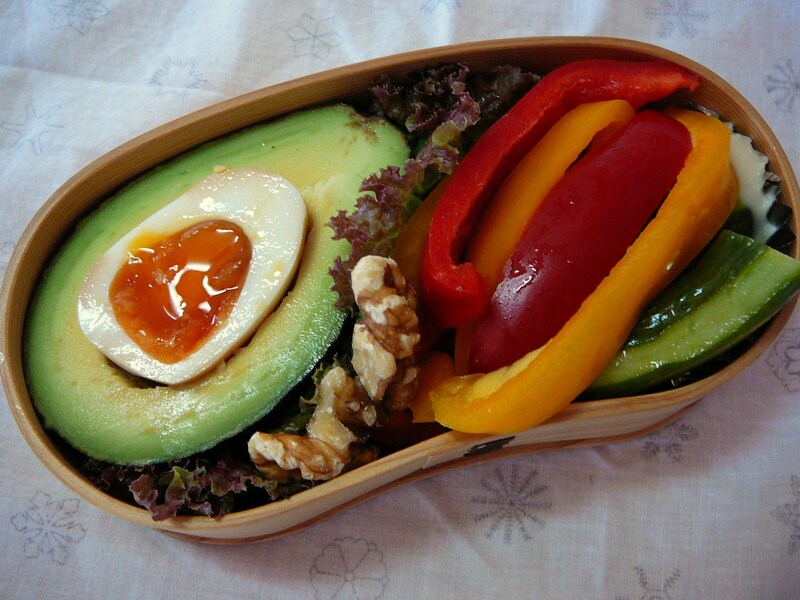 She came up with the interesting idea of including a half avocado pear inside its skin as a kind of vessel with its filling, the whole to be eaten with a spoon (I’ve got one at the office!). 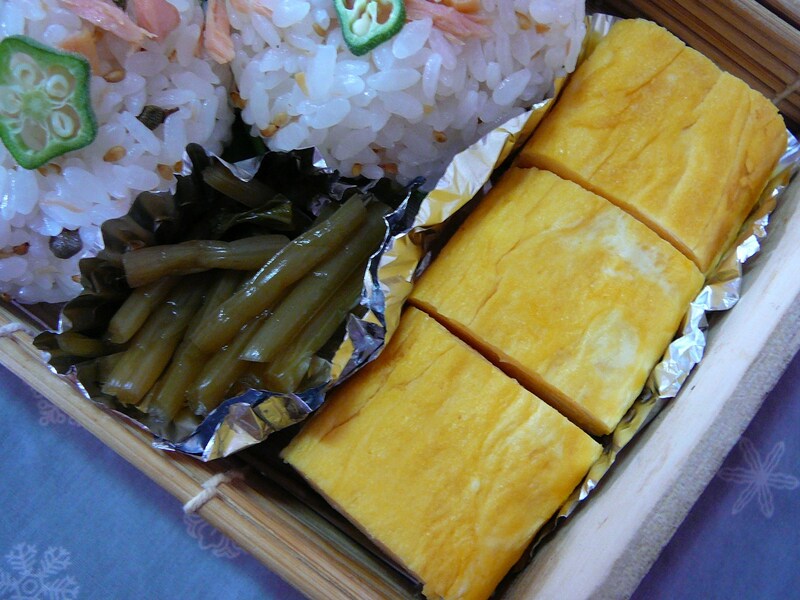 The semi-hard egg had been boiled in onsen tamago style with its yolk still running. 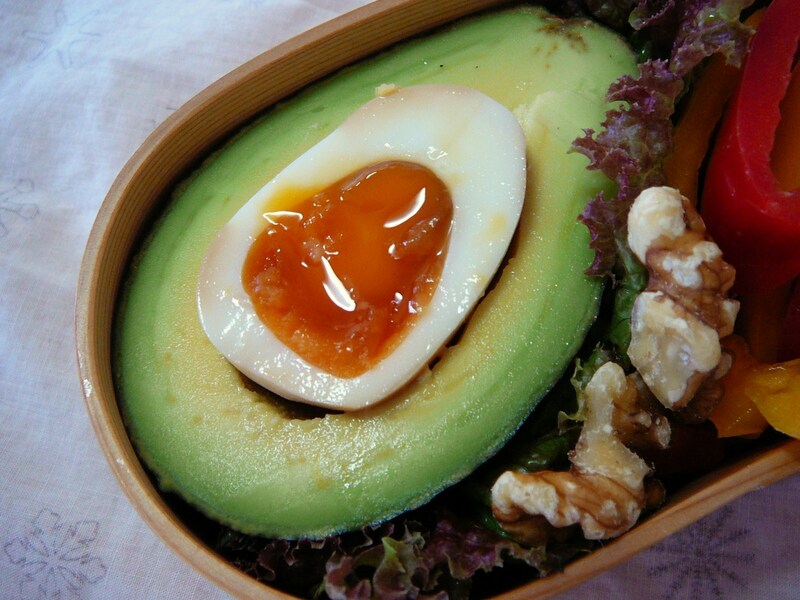 The egg had furthermore been marinated in soy sauce and amazu/sweet vinegar, thus providing the seasoning to the avocado (you “crush” the egg into the avocado with your spoon when eating it!). Some more lettuce for the fiber and Vitamin C, and walnut for dessert. 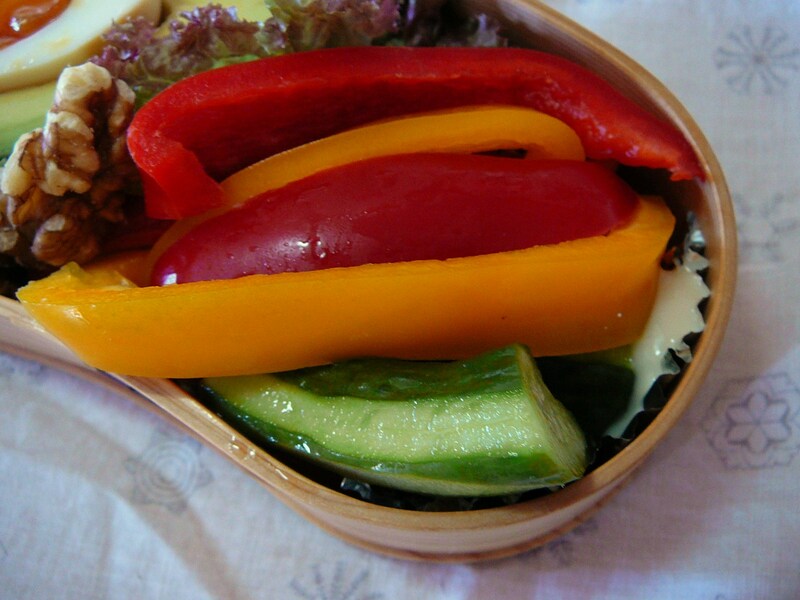 The salad part was completed with raw sweet pimento sticks and home-pickled cucumber. 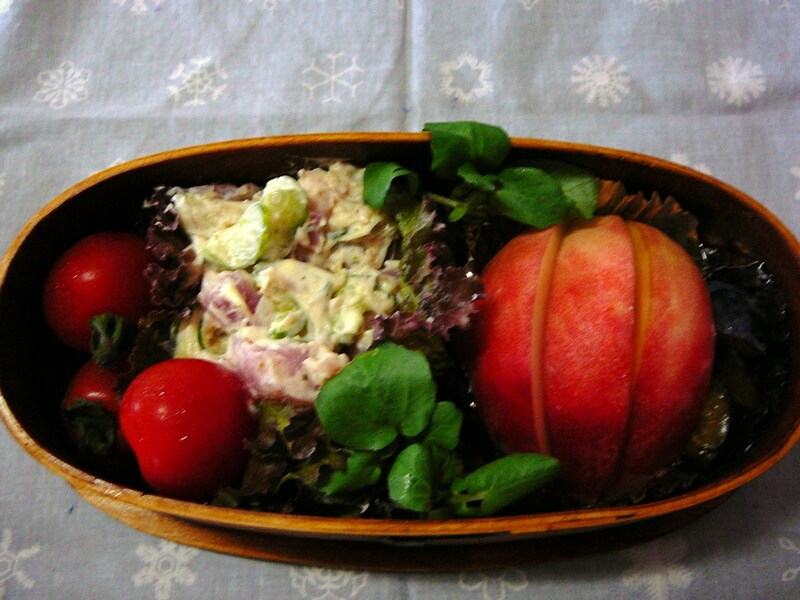 Cream cheese dressing was provided as a dip sauce for the pimentoes. 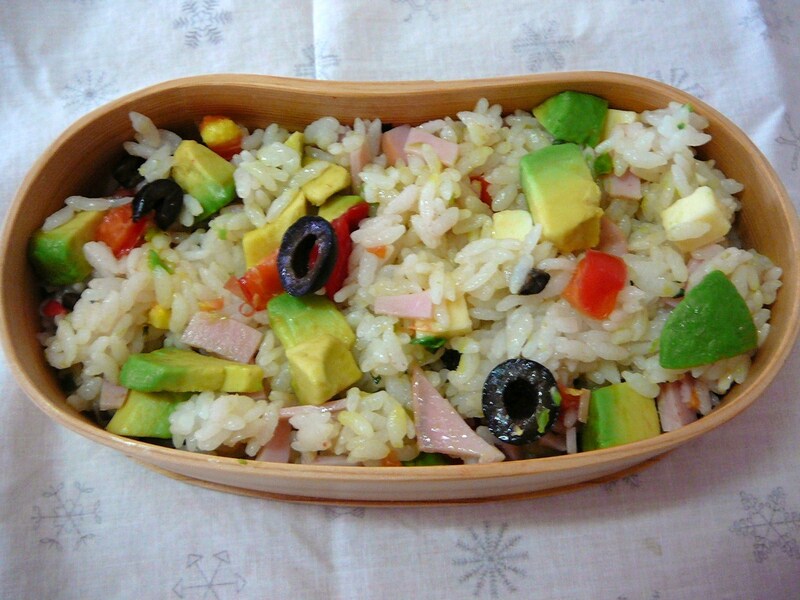 I should have called that bento, Mexican Bento! Most Indian people have to devise their food according to a somewhat harsh climate (at times. Of course people living at the foot of the Himalayas would say otherwise!). The Missus is a great fan of Indian cuisine and anything called “curry”! 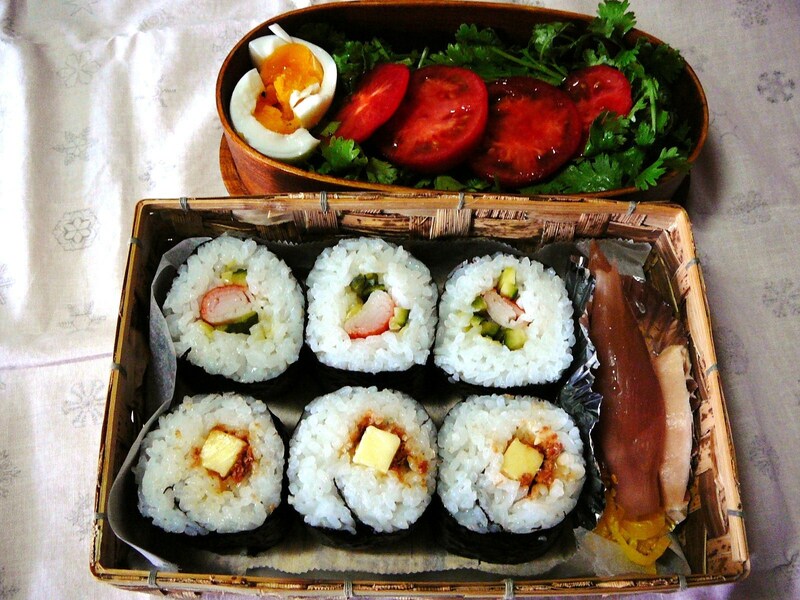 Today, sushi bento day, she came up with a simple twist to call her sushi Indian-style! 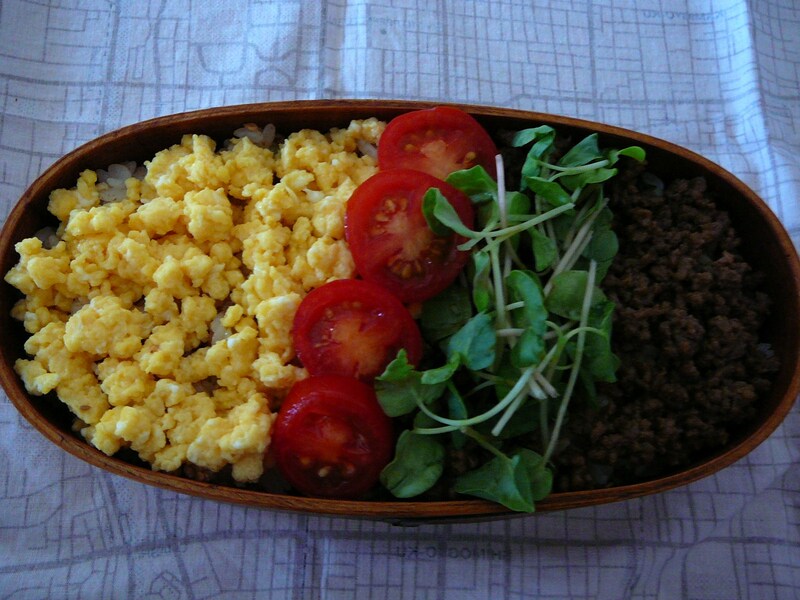 Having prepared the sushi rice, she added a good measure of curry furikake to it. Furikake means “seasoning to be sprinkled” in Japanese. There a good many of them including the curry variety she used today. 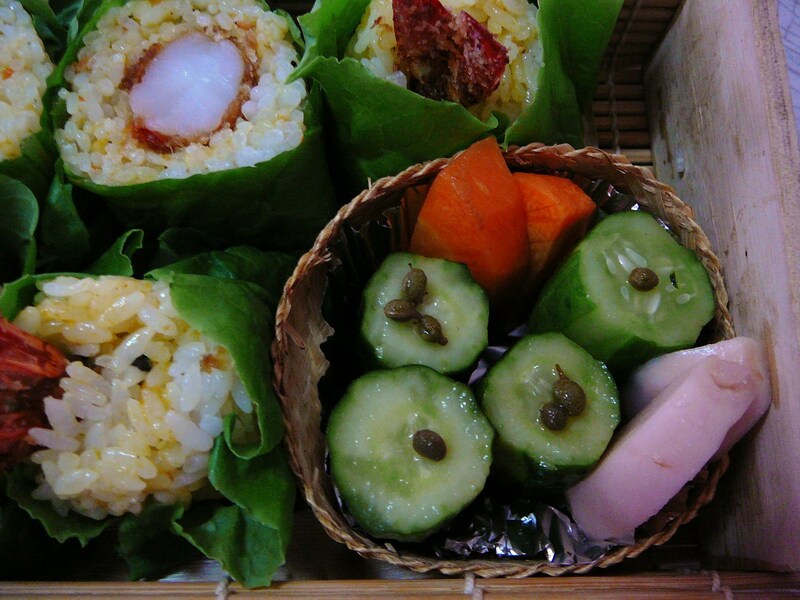 She deep-fried large prawns in breadcrumbs and included them in rolls she made with a bamboo sushi roll and cellophane paper. She then took the rolls out of their cellophane paper and rolled them inside lettuce before wrapping them again into cellophane paper to facilitate the cutting. plenty of home-made pickles to provide me with the salt I will lose during the sweating-hot day: cucumber, fresh geinger, carrot and sansho/Japanese pepper. 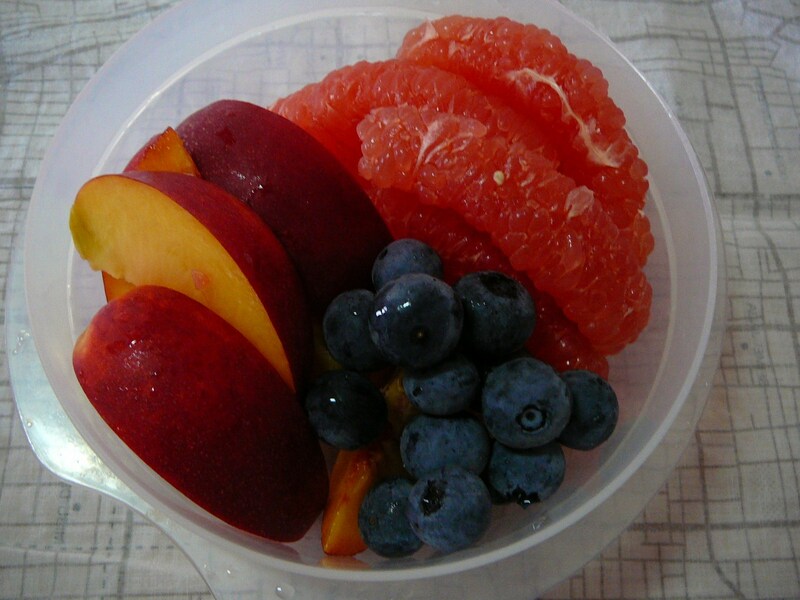 Loads of fruit for dessert for the vitamin C and fibers: red grapefruit, nectarines and blueberries. The latter are supposed to be good for the eyes. If true, they will help mine which tend to get tired at the end of the day with all my PC work! 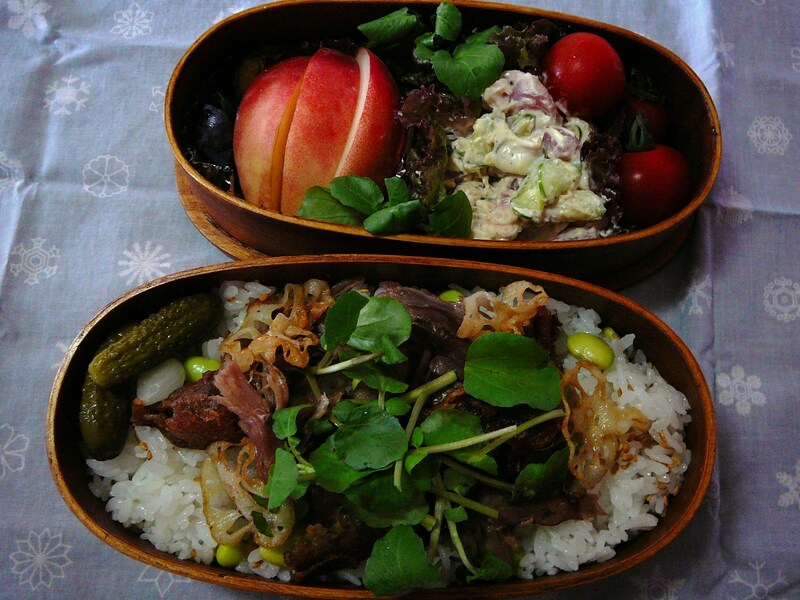 There was no bento to write about yesterday as it was a National Holiday! Instead we spent most of the day lazying about at home as it was simply too hot outside and visited a new (for the Missus!) sushi resstaurant in the evening! The scales were ceratinly a pleasure to look at this morning! Therefore back to healthy food and habits! 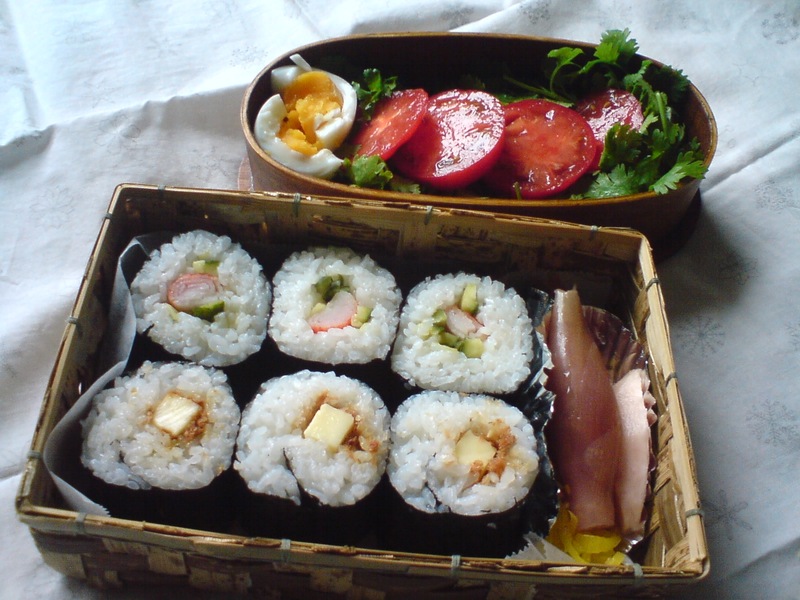 The Missus prepare “Maze Sushi/混ぜ鮨, or “mixed sushi” in English. -“What did you put in it?” I asked most politely. 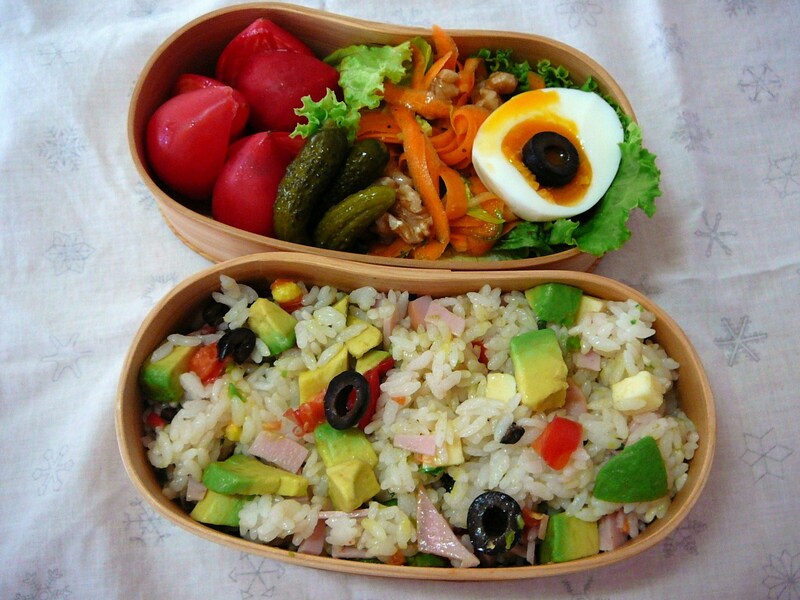 Avocado, ham, cheese, black olive, tomato, sansho/Japanese pepper (pickled), …. that does make 10! I’m in for a beating tonight. The “salad” was certainly colouful once again (and tasty, an healthy!)! Cut Renaissance tomatoes grown in Kakegawa City (I buy them regularly at Kakegawa Station on my way back from university), cornichons, lettuce, carrot tagliatelle saled with walnuts, and semi-boiled egg topped with black olive. East meets West! 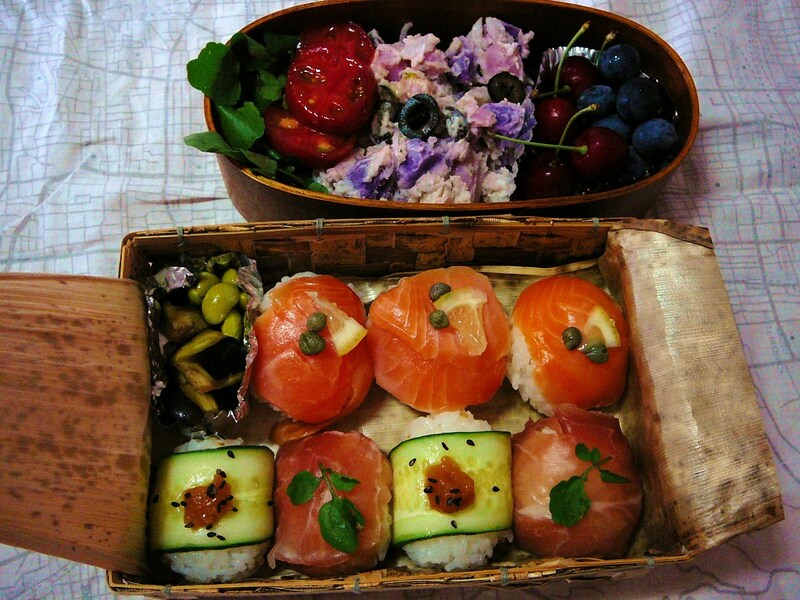 Tuesday’s Bentoes have become a regular feature as Sushi Bento! 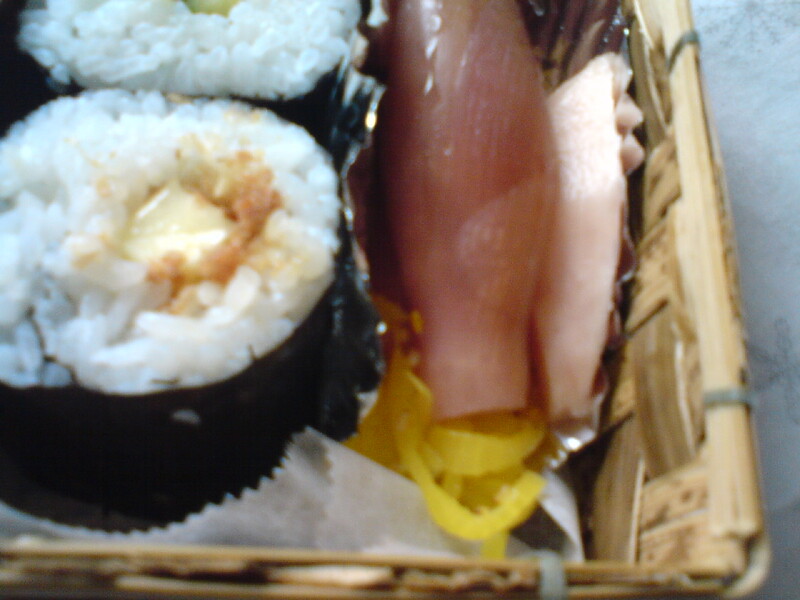 Today’s bento consists of Te-mari Sushi/手丸寿司 or Hand-shaped ball sushi (not easy to translate, so read the explanation!). The Missus could not decide which picture to choose, so it is my pleasure to show another angle! 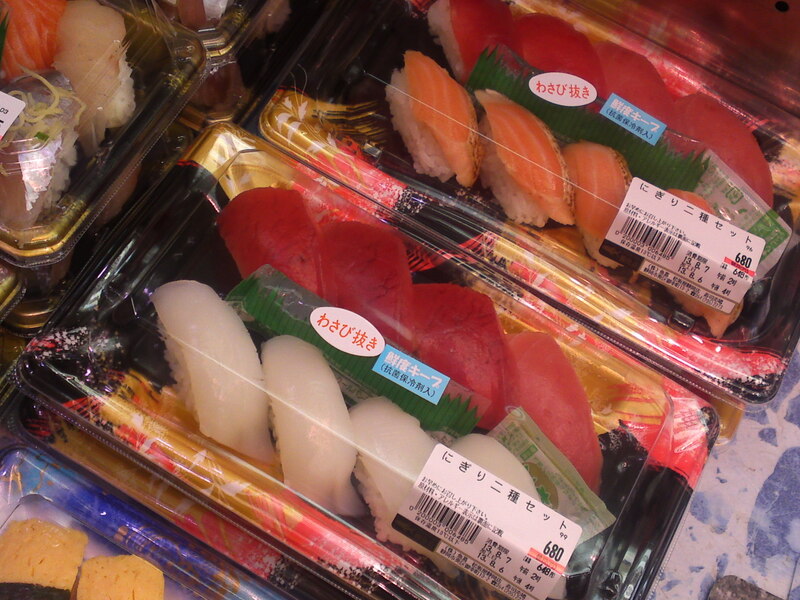 Te-mari sushi are naturallly made with sushi rice. 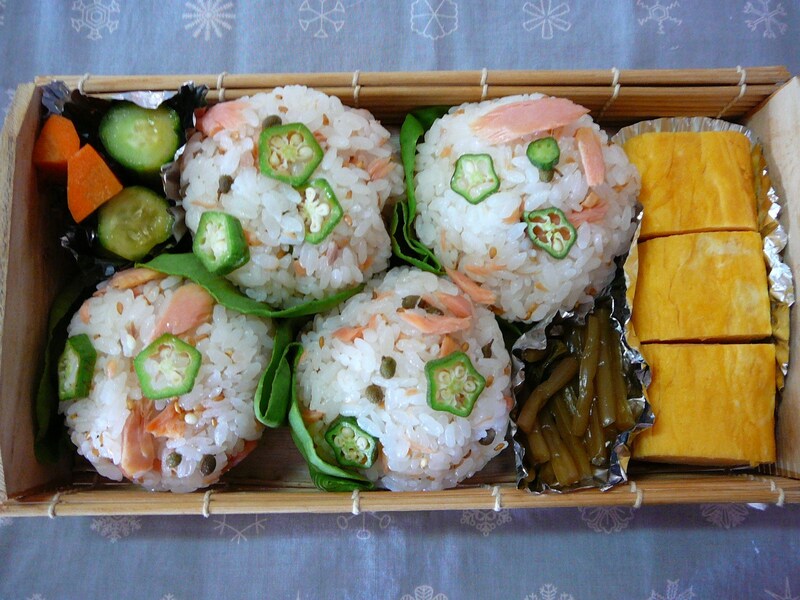 1) Make small rice balls (they can be as small/big as you wish!) either between the palms of your hands or by wrapping some rice inside cellophane paper and twisting the cellophane paper tightly around the rice to form a ball. Unwrap the balls and put them aside. 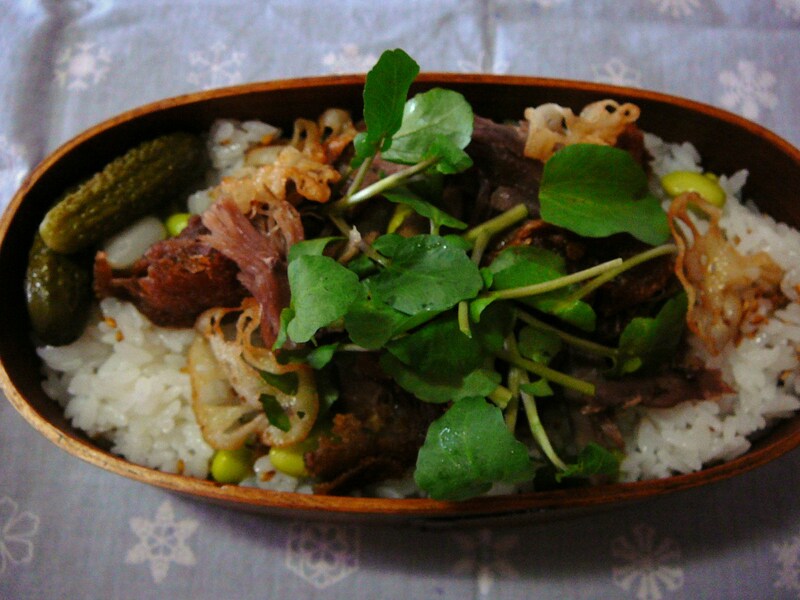 2) For each te-mari choose the”neta/topping”. Lay a large enough piece of cellophane paper in your palm. 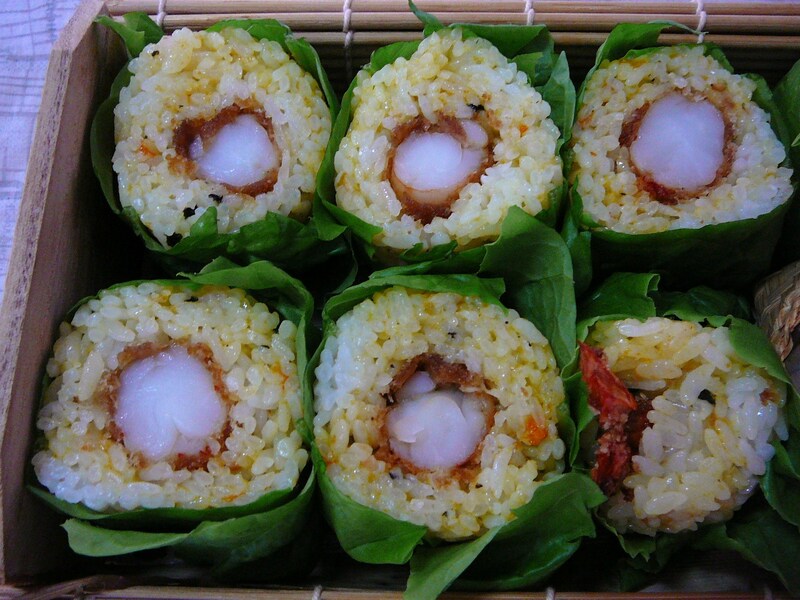 Place the topping upside down (important as all is inverted), place the rice ball on top, close the cellophane paper around the te-mari and twist it closed tightly enough for easy unwrapping and placing inside the bento box. 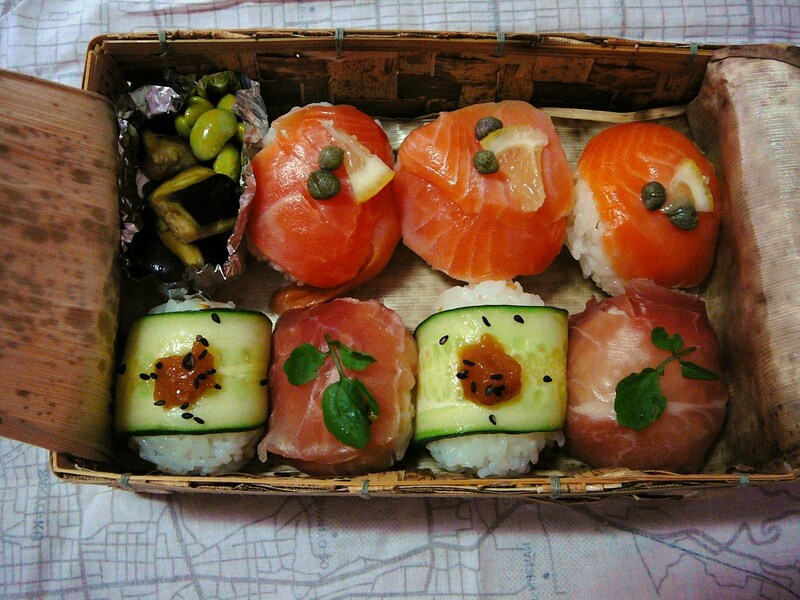 1) Smoked salmon te-mari topped with lemon and capers. 2) Raw ham topped with cress. 3) Cucumber (she sliced it thinly and took the excess humidity first with kitchen paper) topped umenoshi/Japanese pickled plum flesh and black sesame seeds. 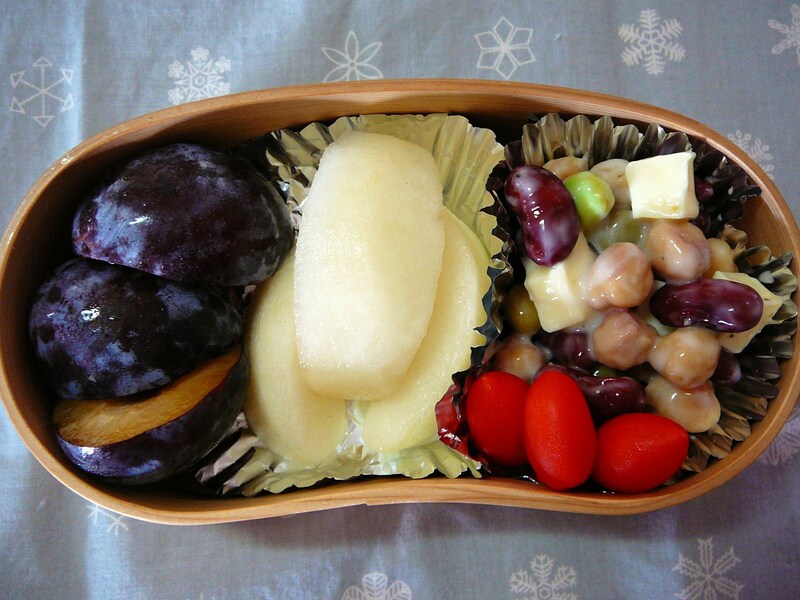 She added home-made pickled aubergines/egg-plants and edamame. 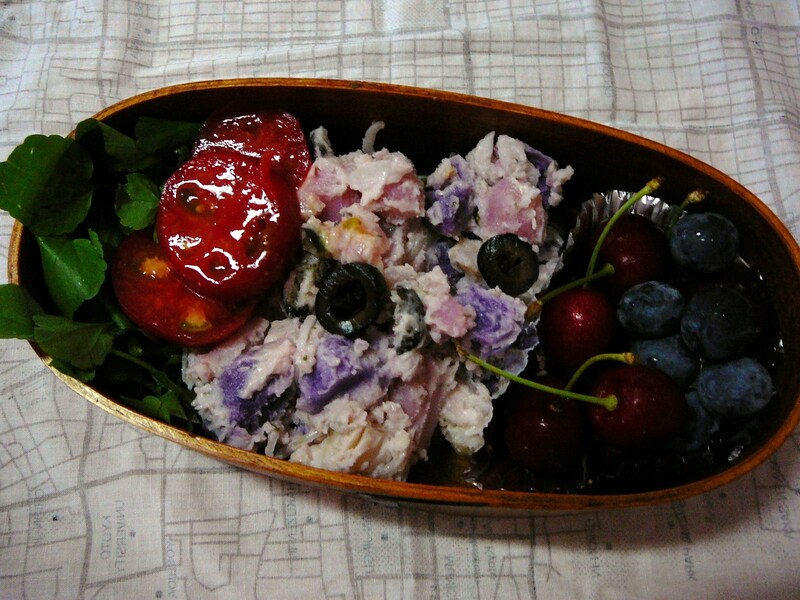 As for the salad-dessert “dish”, the Missus included three-coloured potato salad (yellow, pink and violet) topped with black olive, sliced tomato over a bed of cress, cherries and bluberries for dessert. 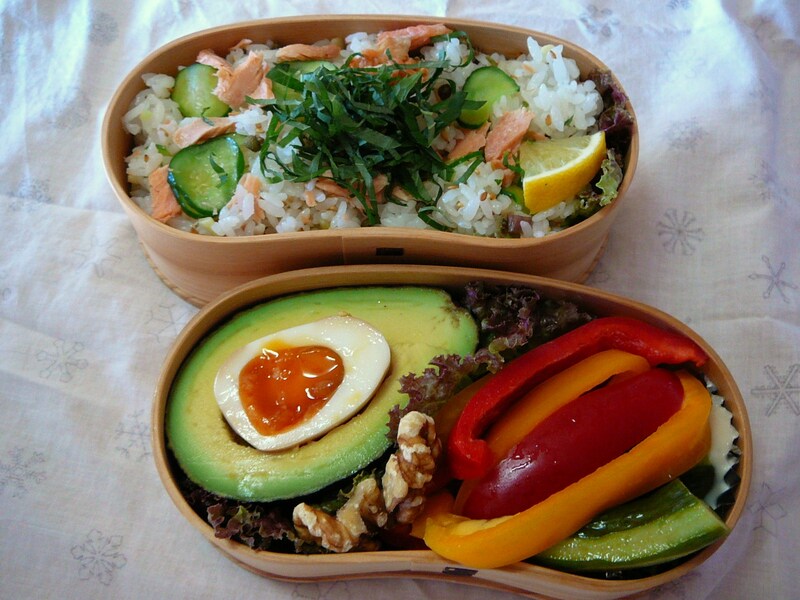 Certianly made for a big and tasty bento! In these days of incessant weather change, one has to make sure of his/her sustainance. 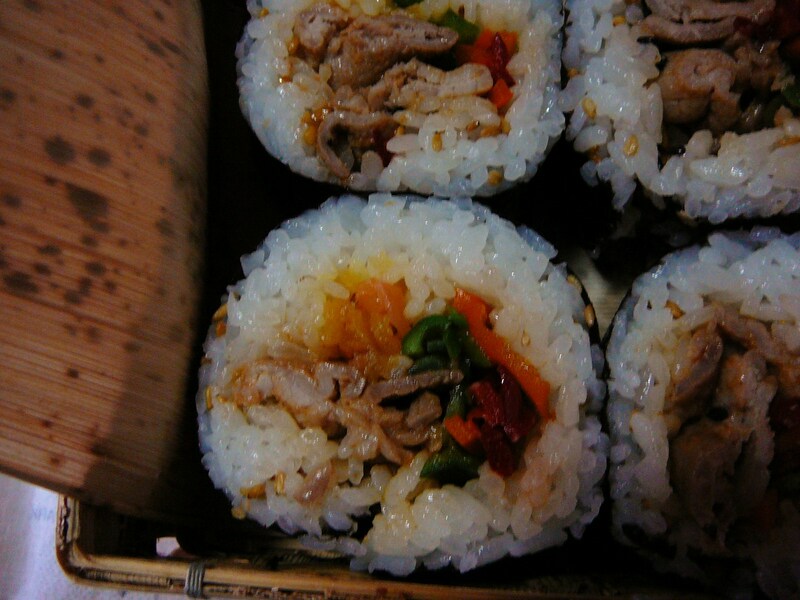 In winter, when they are in need of calories, the Japanese often visit the innumerable Korean restaurants in their cities. 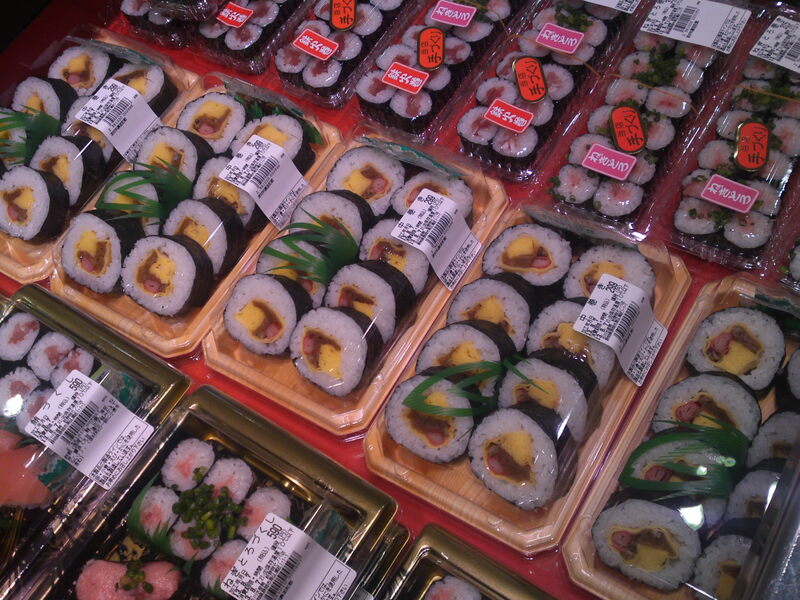 I believe that the Korean are tempted with lighter fare such as sushi in summer (I’m only assuming!)! 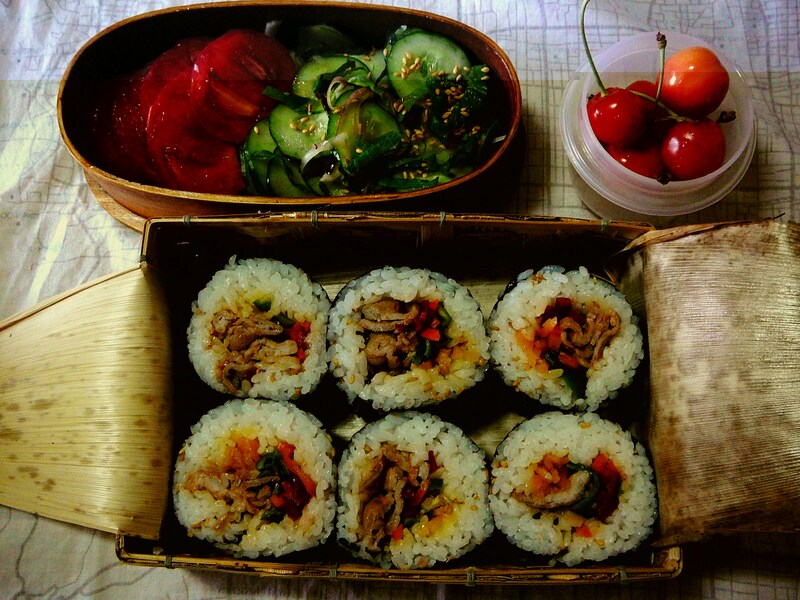 That is why the Missus came up the idea last night to create a Korean sushi bento of her own for today, Tuesday sushi bento day! That orange colour is definitively that of kimchi! 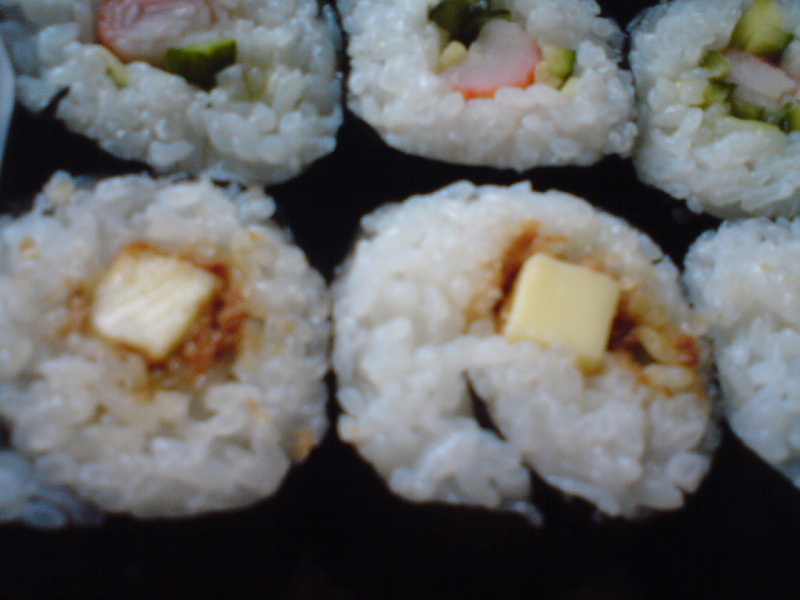 After steaming the rice and arranged it as sushi rice, the Missus mixed it with “golden” roasted sesame seeds. Before spreading the rice on the seaweed, she brushed the inside of the nori/dry seaweed with sesame oil. 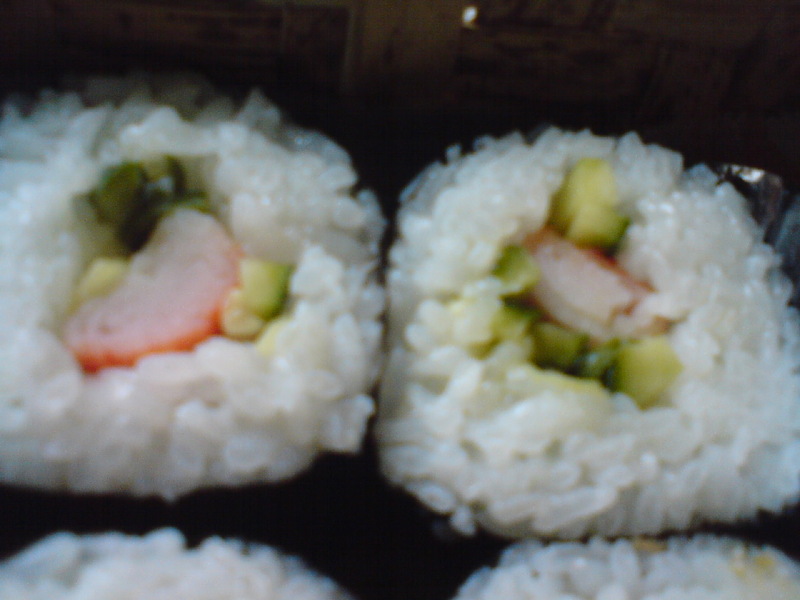 She then lined the sushi rice with 3 types of pimentoes she had cut into thin strips before frying them in sesame oil/namuru style. On top of the vegetables she spread thin slices of pork she had fried Korean-style with spicy sauce and black roasted sesame seeds. 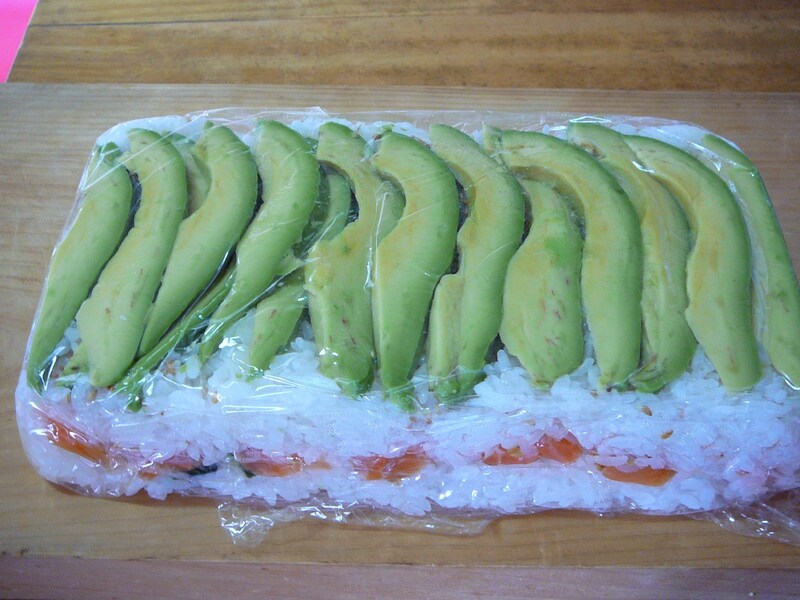 For a closer view of the sushi roll cross section! 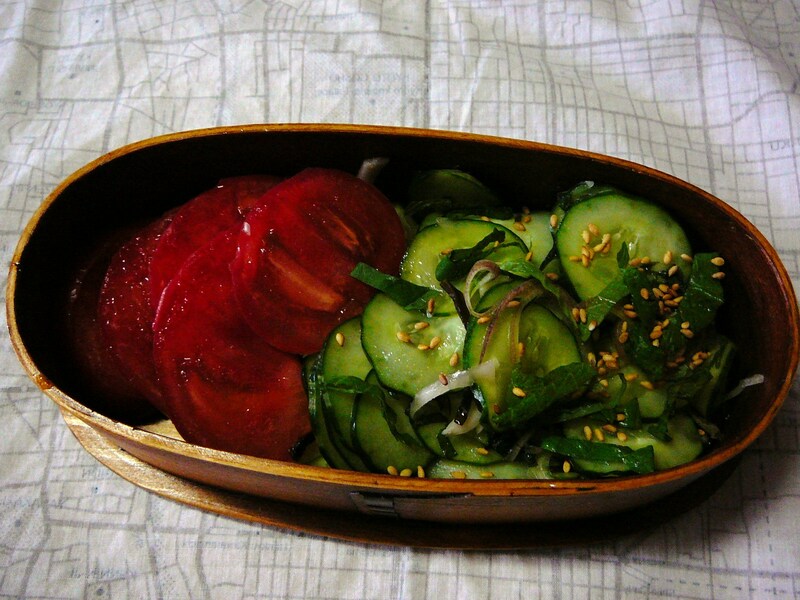 The Koreans eat a lot of vegetables with their meat, so the Missus did likewise with a salad duo of freshly cut large plum tomatoes and a combo of cucumber, myoga ginger, shiso/perilla leaves, konbu/seaweed, daikon and sesame seeds. Cherries from Yamagata Prefecture for dessert! I made myself scarce and took my shower (the safest palce away from the real Dragon!). She kept things very simple, healthy and light as you can see. Which suited me fine, as I ate a lot yesterday! Anyway, she made two types of rolls. 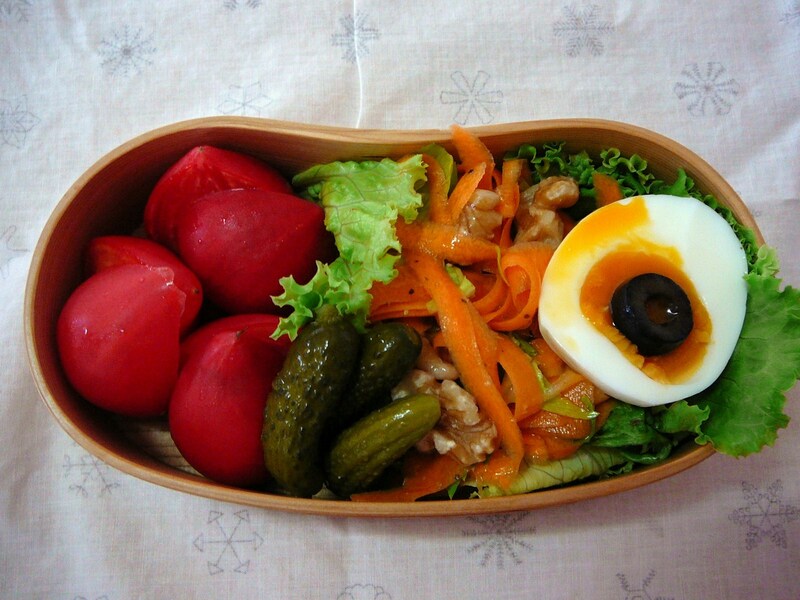 One included home-pickled cuumber strips and surumi (the latter bought at the supermarket). The other one contained processed cheese and o-kaka. O-kaka is a mixture of dry bonito shavings, sugar, miso, soy sauce and ground sesame seeds you can easily buy. 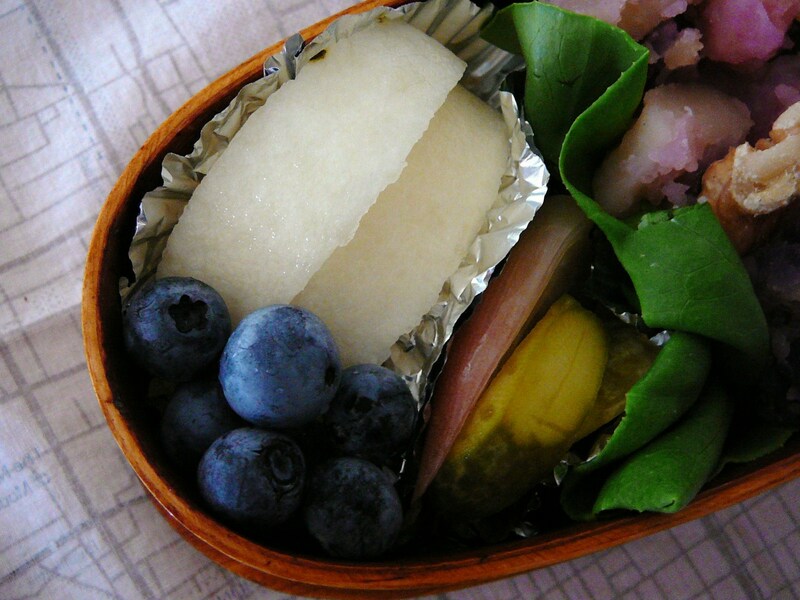 The pickles included myoga ginger (home-made), Fresh ginger root (home-made) and yellow takuan/pickled daikon (bought). 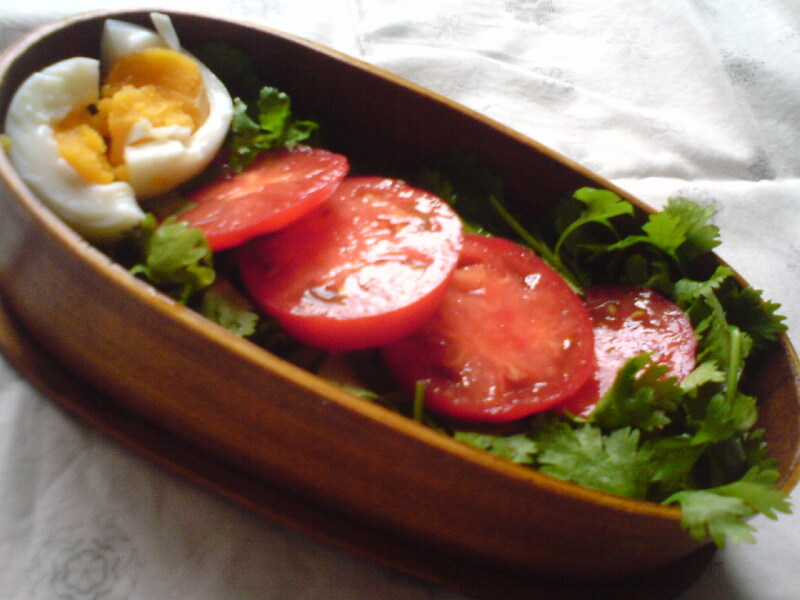 As for the salad I was offered sweet tomato (“sweet enough for your dessert) and a soft-boiled egg on a bed of fresh coriander! 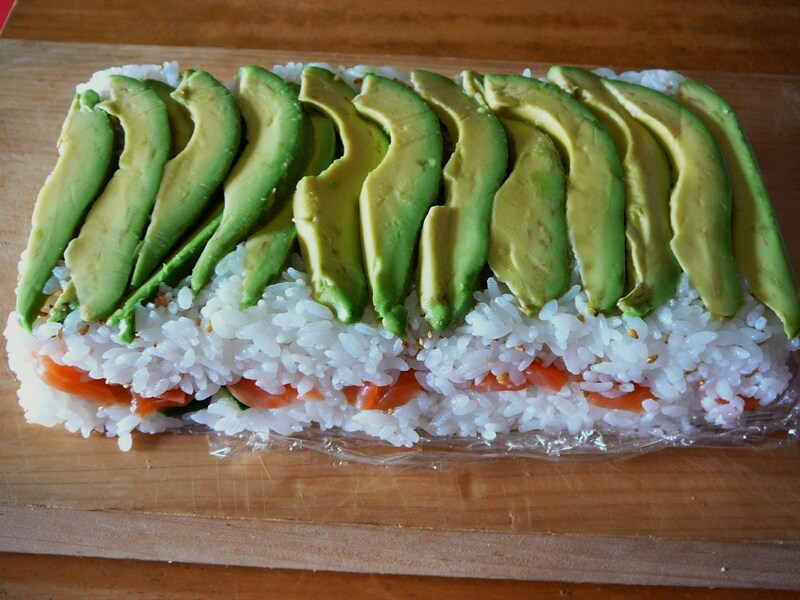 The weather is perfect for sushi! It has been raining non-stop, at times at typhoon level, for the last 24 hours and more rain is on the cards for the next two weeks! 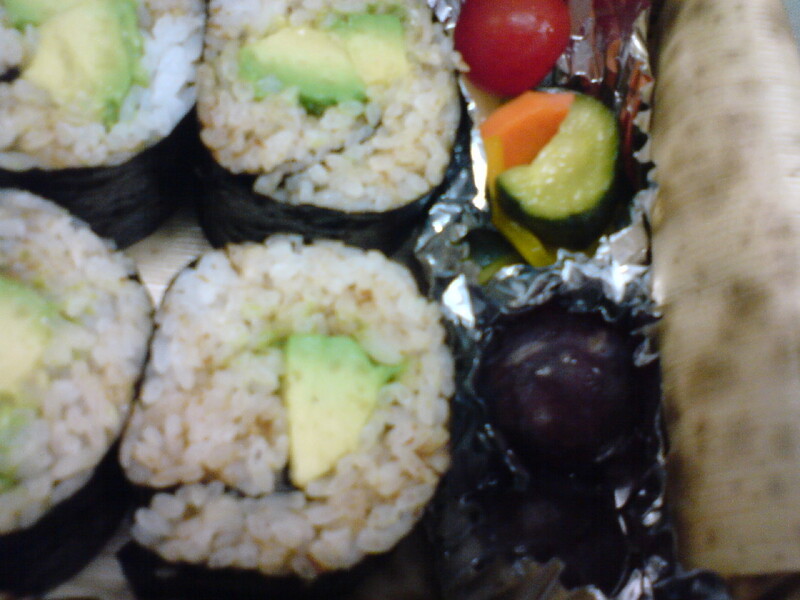 The Missus seems to have got the message as yesterday’s university train bento consisted of large sushi roll (report prohibited! LOL). On top of that, I was invited to a sushi restaurant last night (report coming soon). 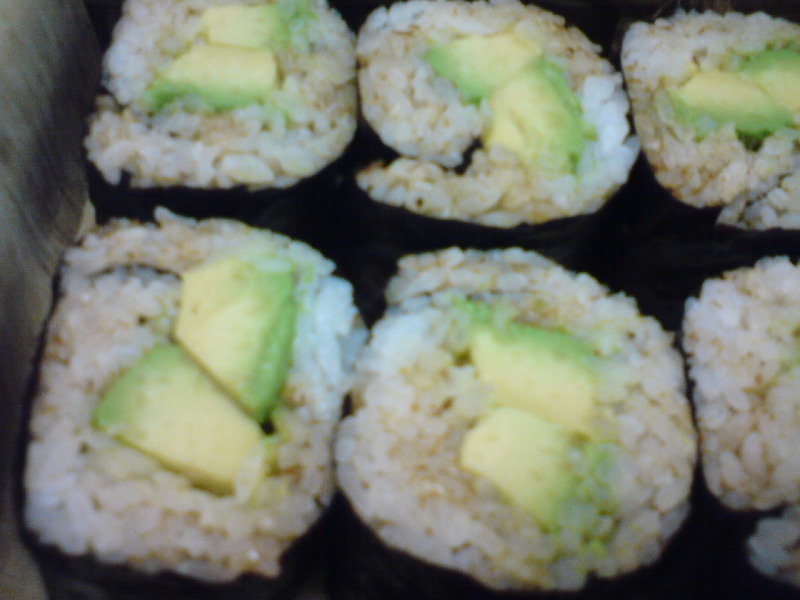 And to finish it, I had musubi/rice balls for breakfast and now avocado rolls! 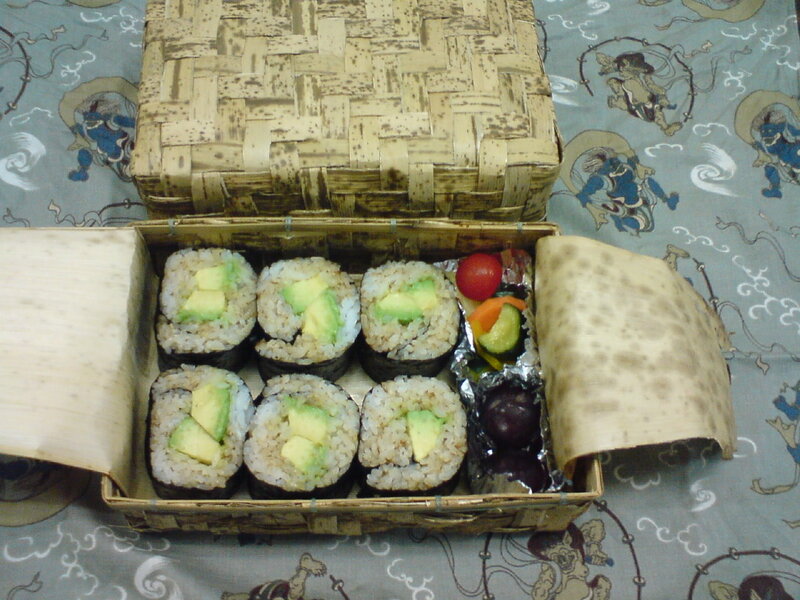 The rolls were hastily inserted inside that old box of mine made of bamboo fibers lined with a large dry bamboo leaf. 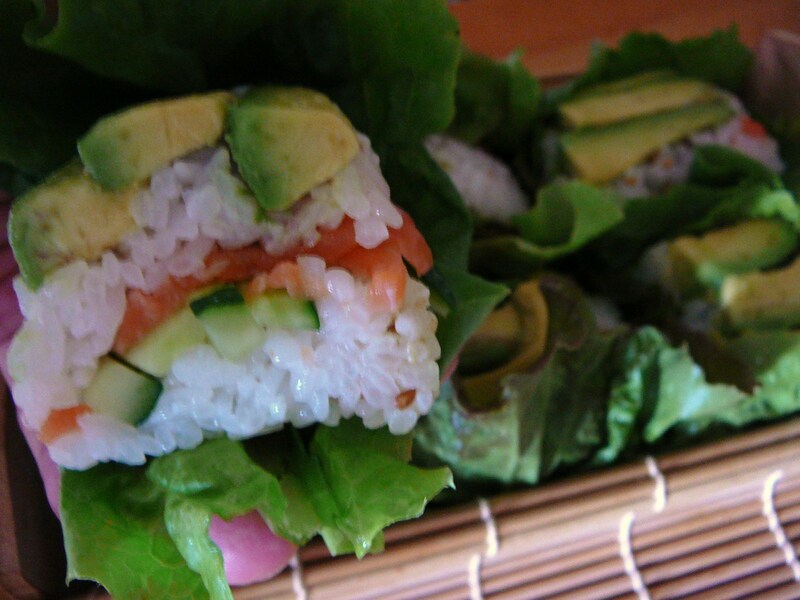 The Missus steamed some fresh sushi rice this morning although instead of adding the usual rice vinegar to the rice, she seasoned it with with a little soy sauce before rolling it around avocado. Home-made marinated salad for the fibers and some Chilean grapes for dessert. The little red and white tag means that the wasabi is served separately! 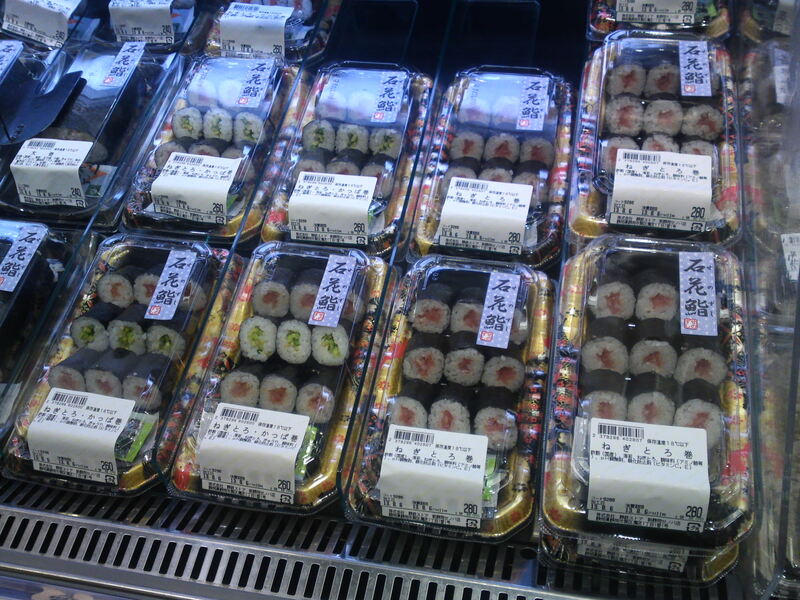 This time let me take you to Cenova Department Store basement Floor where you will find not one but two supermarkets proposing sushi bentos, sets and takeouts! Let’ visit the second one which is owned by the Shizutestsu Stores Chain!! 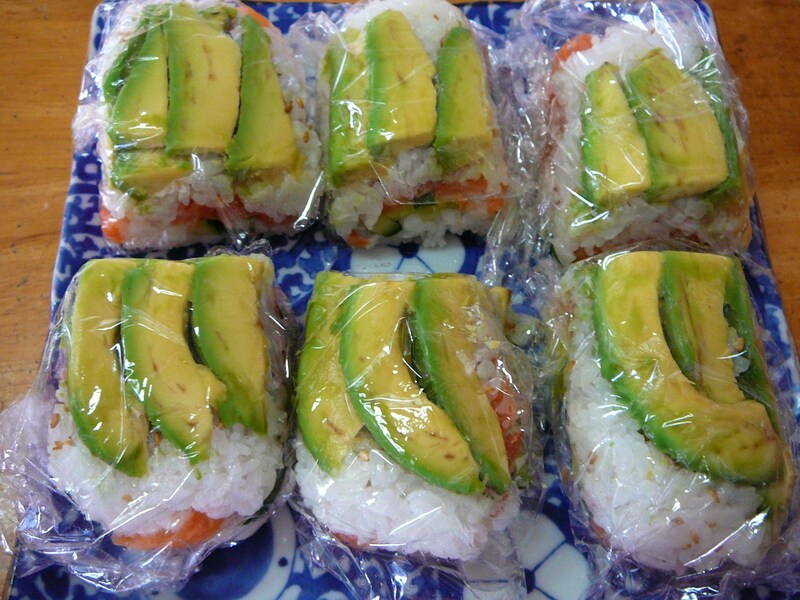 Thin rolls for all priorities, including vegetarian all 260 yen a pack! 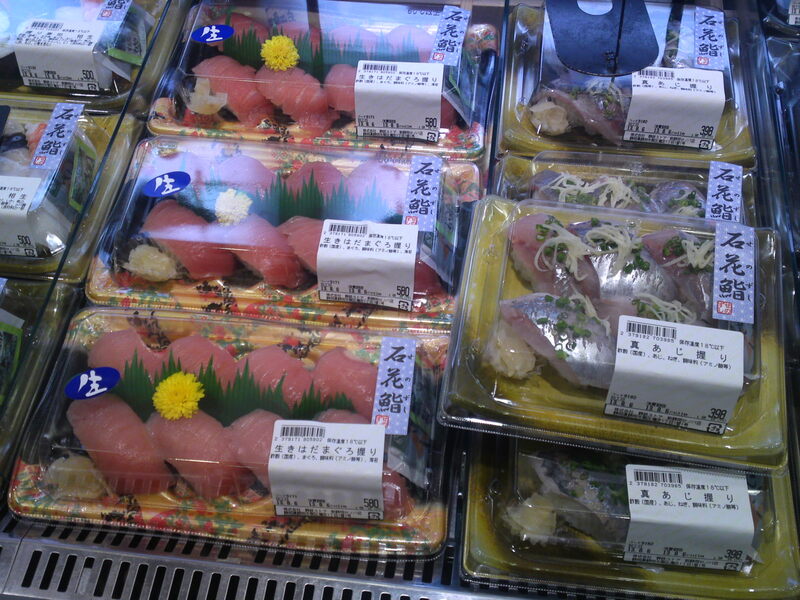 A pack of 8 tuna nigiri sushi for 580 yen or (right) or 6 horse mackerel nigiri sushi for 398 yen. 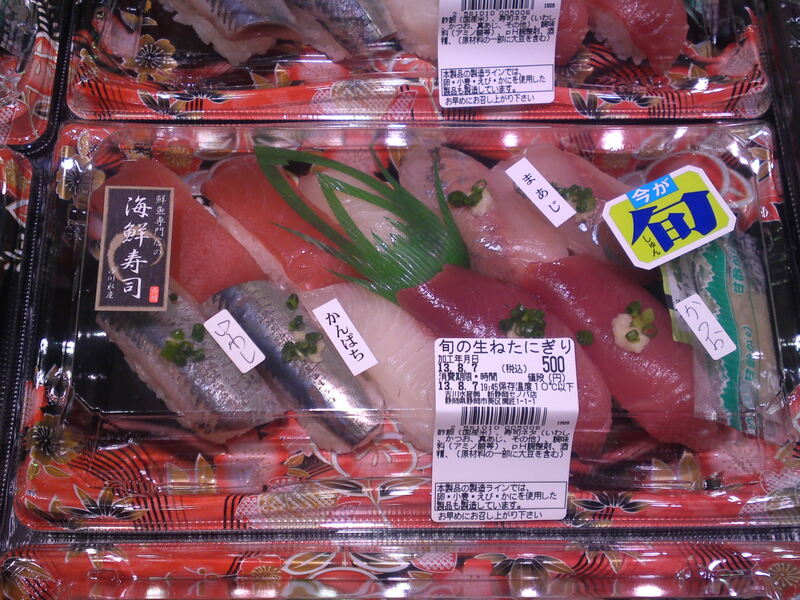 Horse mackerel is Shizuoka specialty! 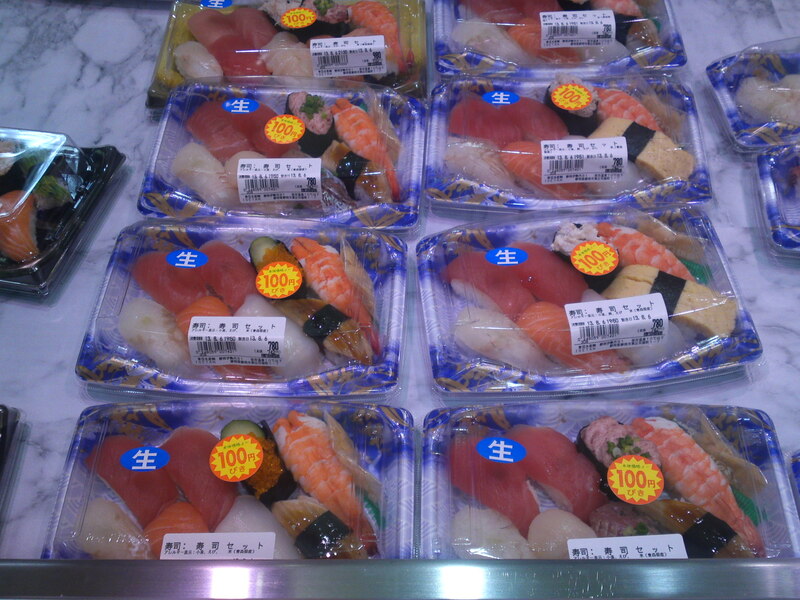 A set of 10 smaller nigiri sushi for 680 yen including flying fish roe, tuna, scallops, salmon and so on! 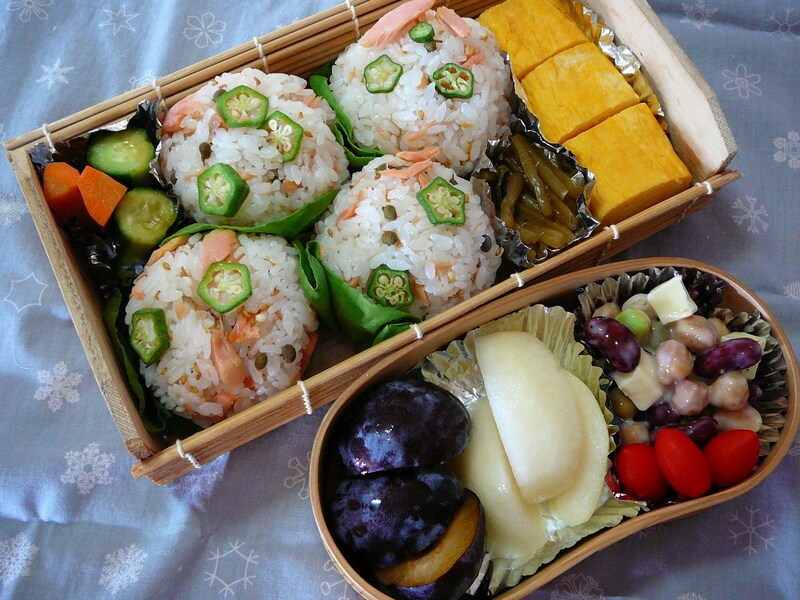 A similar set in an easy to carry bento box for 780 yen but with ikura! 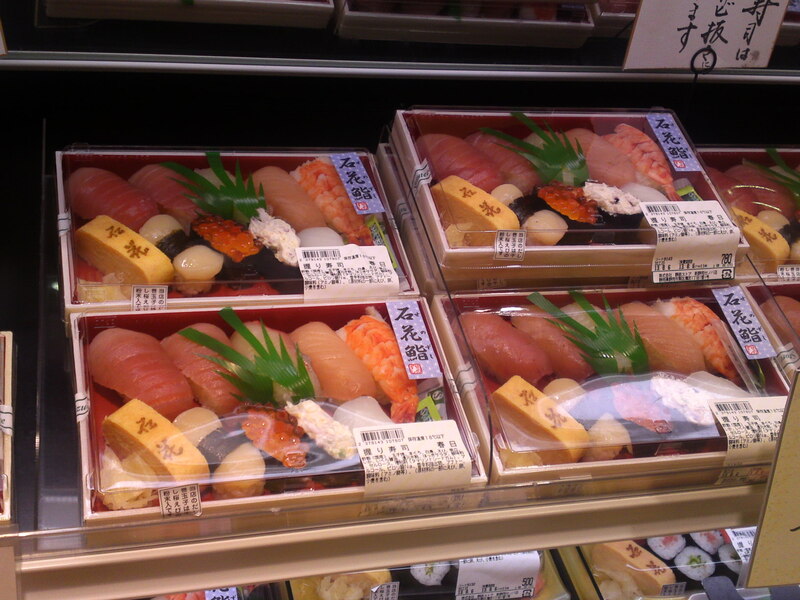 Two similar sets for 780 yen including 9 nigiri sushi (with a 100 yen discount!) 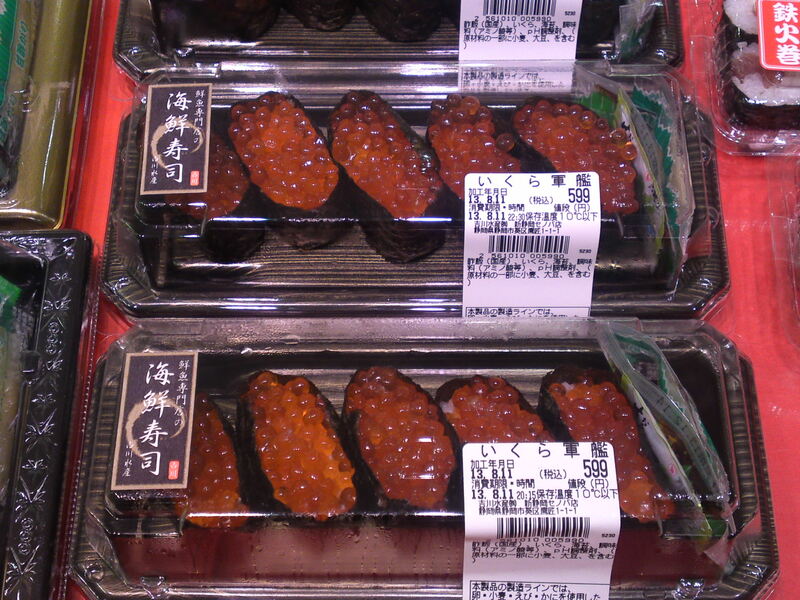 one with flying fish roe on cucumber, the other with negitoro/grated tuna! 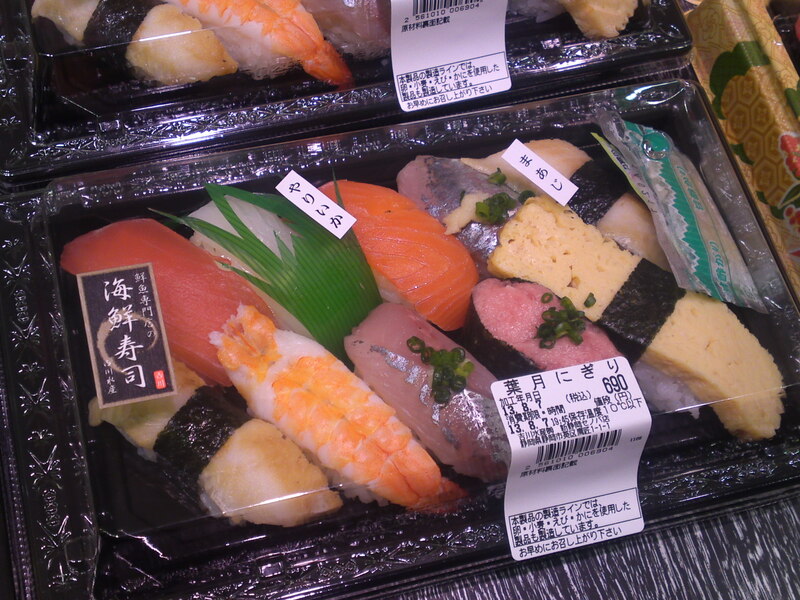 A very reasonable set for 690 yen comprising 10 nigiri sushi! Note the small pack of pickled ginger! 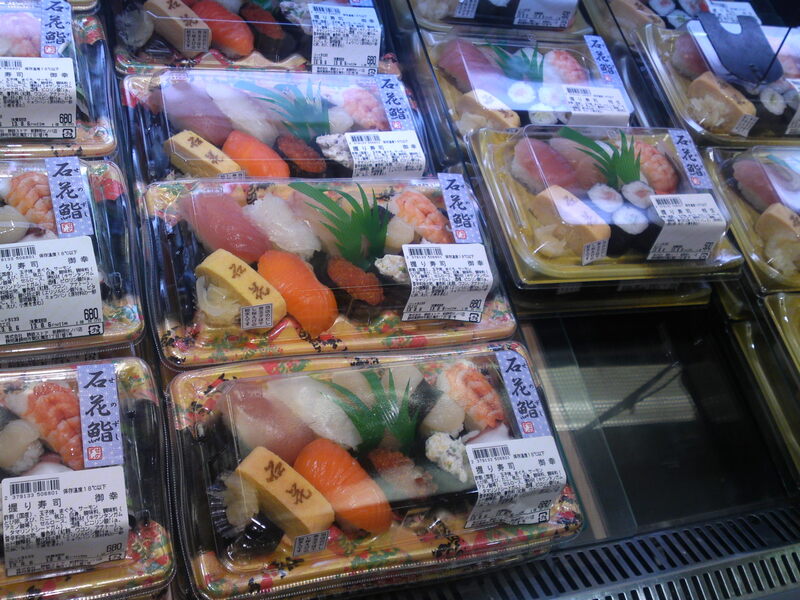 Now this set of “Shun/旬/Seasonal seafood”, 10 of them is really good value, even in spite of the smaller toppings! 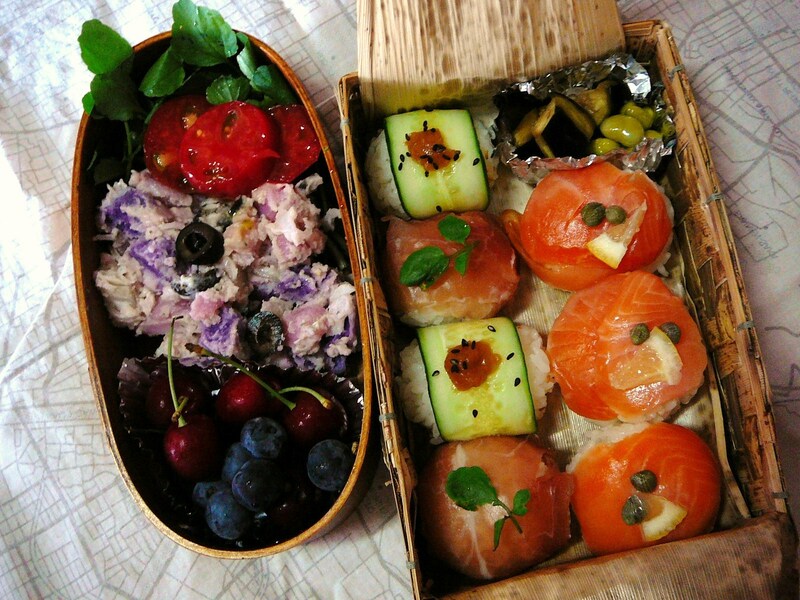 An all-salmon sushi nigiri bento for 590 yen with raw salmon, seared salon, and gunkan containing oya-ko/parent and child/ikura and small pieces of raw salmon! 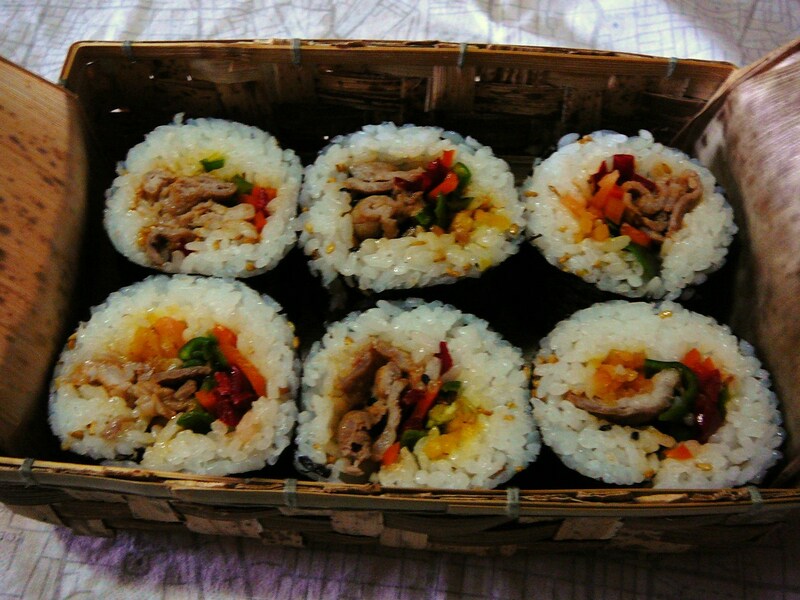 For maki/rolls lovers! Extremely good value! The next and last stop will be at Isetan Department store!